A few weeks ago, I wrote this post about some of the elements in our master bedroom. While the bed/ bedspread, side tables/lamps and wall personalization are the key focal point in the room, I really think it's the little details that help round out the space. The master bedroom is kinda "my space" in the house where Kirk gives me free reign (with some limitations - we have to have a flat screen in there. Ughhh! Oh well...) to implement my beloved shabby-chic-girliness. I found this chair about two years ago at Pier One. I fell in love immediately! It's an off-white color with blue-grey French writing on it. I lived in Paris for a brief while, and also am fluent in French (I studied that fun language for 17 years. Now that I'm in Texas, I really wish I had pumped that effort into Spanish, but whaddyagonnado, right?). The sequined pillow was purchased after Kirk and I moved in together as part of a plea bargain. He got a blue throw blanket for the couch, and I got a frilly, ridiculous pillow for my chair. Win-win! The black and white prints were actually taken by my husband! He's got a side interest in photography. They're of various landscapes and landmarks around Minnesota. (The black thing to the left is a small dresser, and my "beloved" flat screen). This vanity and I go WAY BACK! 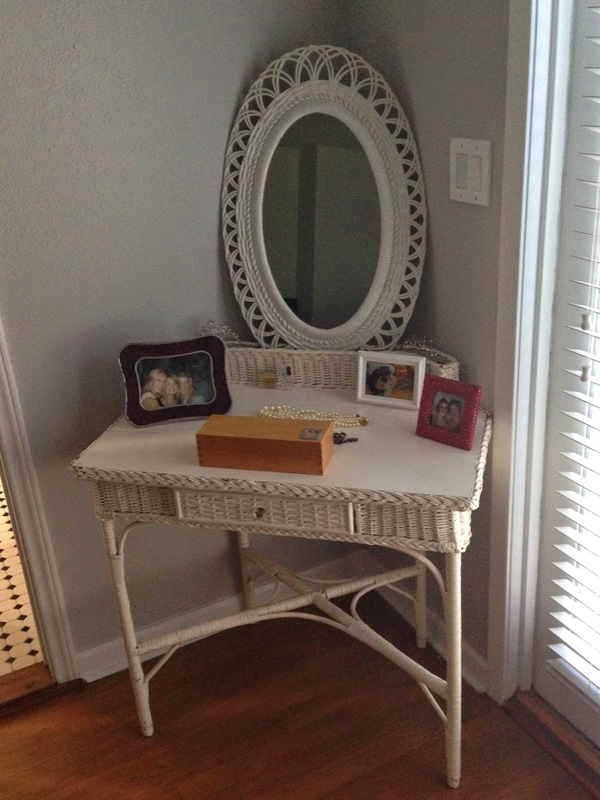 I had always wanted a white wicker vanity - and by "always" I mean since I was literally about five years old. Back when I was 16 or so, my mom and I were out antiquing for mother's day and found one! We picked it up that day, and it has since made every move with me - multiple apartments in Minneapolis, a cross country move to Savannah, GA for graduate school, back to Minneapolis to a few more different apartments, and finally, another cross-country move to Dallas. Pretty sure this vanity has seen more of the country than most Americans. It's well traveled! I don't know if Kirk likes it, hates it or is indifferent to it, but he knows it's story and I managed to marry a man smart enough to keep mum about something so close to my heart if he didn't care for it. On it I keep several pictures of my favorite ladies, a few vials of perfume I never wear (I'm actually allergic to perfume), and my jewelry box. On either side of the mirror are my tiaras from being Miss Saint Louis Park and Miss Minnesota (circa early, early 2000's). Yes, I've been in a few beauty pageants! They were a blast. And the Miss Minnesota title paid for my first year of college, so that was fantastic. This was not some Toddlers and Tiaras situation, mmmmmkay? My first pageant was at 18! It's these little details that make me really love the space. The furniture (bed, side tables, book shelf and small dresser) are all dark and manly; so it's key that these pieces are in the room to provide some feminine balance. I also think it's important to have some deeply personal items in your bedroom, and these two items are just that. Things look a bit different around here, don't they readers? Heck, even this font is different, and I didn't even attempt to change that! Whatevs. Here's the story: I purchased my domain (www.anuncomplicatedlifeblog.com) from Go Daddy in the beginning of March. I futzed around with Blogger and ultimately decided to also purchase some website building/design software to host the site, then simply have Blogger feed into the site to maintain the "blog" atmosphere. This was great in theory, because I had more design elements to choose from and play with. But the end result meant that I started my posts in Blogger, then had to transfer them over to the design software, essentially publishing/positioning/editing two times for one post. Which is fine enough for now, but no-way-Jose for when this baby gets here. Aint nobody got time fo dat. Also, the design software kinda blurred my photos, even though they were high res and I had WAY more control of the editing of them. Linking up social media sites and building out pages was super easy in that software, but I lost some of the functionality of a blog (being able to fully participate in link-ups and button publishing, immediate access to commenting, etc) by having an independent website. Also, my analytics tell me the majority of you read my site via your phones and the mobile app STUNK from my site, didn't it?! My pictures were everywhere and I had no control of editing the mobile functionality. So dumb. So I decided to make the shift fully over to Blogger. I started to alter the design elements in Blogger to more closely resemble my site, and called Go Daddy to have my domain transferred over. The guy I spoke with told me my original site would remain live for 48 hours... So clearly, the original one voided and my new site went live immediately. Ummm, yeah, I wasn't ready for that! This site isn't quite "there yet" in terms of design and a few functionality issues, but rest assured, I'm working on it! I thought I had a few more days to make it pretty for y'all. Nope! Ah, such is life. Thanks for hanging with me as I get the details worked out and get this website back in good shape. 2) Since we had a visitor in town all week, and she just so happens to be future baby boy's grandma, we did a little shopping... And managed to get another load of baby necessities! After the shower this weekend, we'll take stock of what's left to get and make the final rounds of purchases for baby. He could be here in as little as three weeks and as long as eight! Whoa. 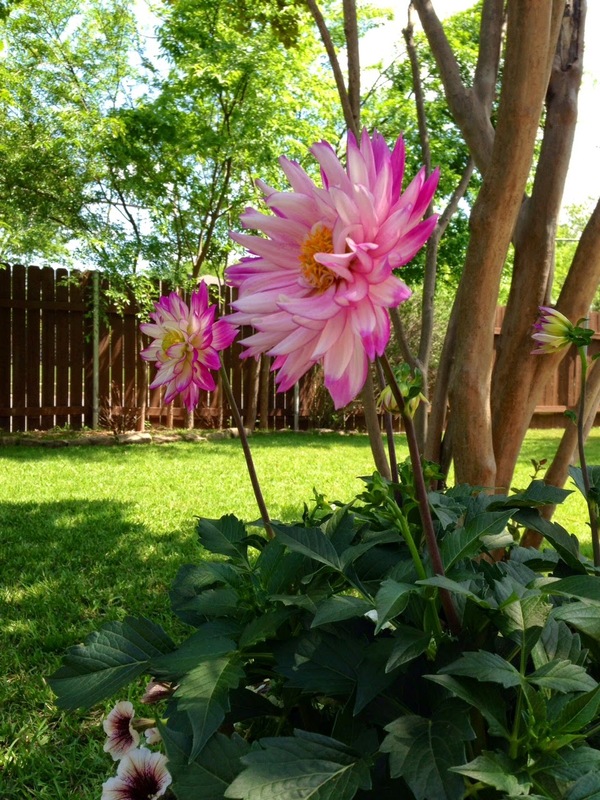 3) I've been wanting to add color in the form of flowers to our backyard since we moved in in late February! Typically this can be done in March, but with our bizarre winter and random temperature swings made me hold off until this week. It now looks like people have made this house a home! 4) I came across what was easily a three to four inch cockroach in our house the other day... I don't do well with cockroaches. In Georgia, they're even bigger and they FLY, so I've dealt with worse than this creepy fella. But wouldn't you know, our dog Baxter LOVES to kill bugs! Any bugs! All bugs! And gross little lizards, too! Better than that, he seemed to sense my distress, came out of nowhere, and jumped in on that nasty situation. Killed that cockroach dead. *Somebody* got an extra treat that night! He's a good guy to have around when your husband-bug-killer is traveling. 5) Did I mention it's our coed baby shower and housewarming party this weekend? Because it is. 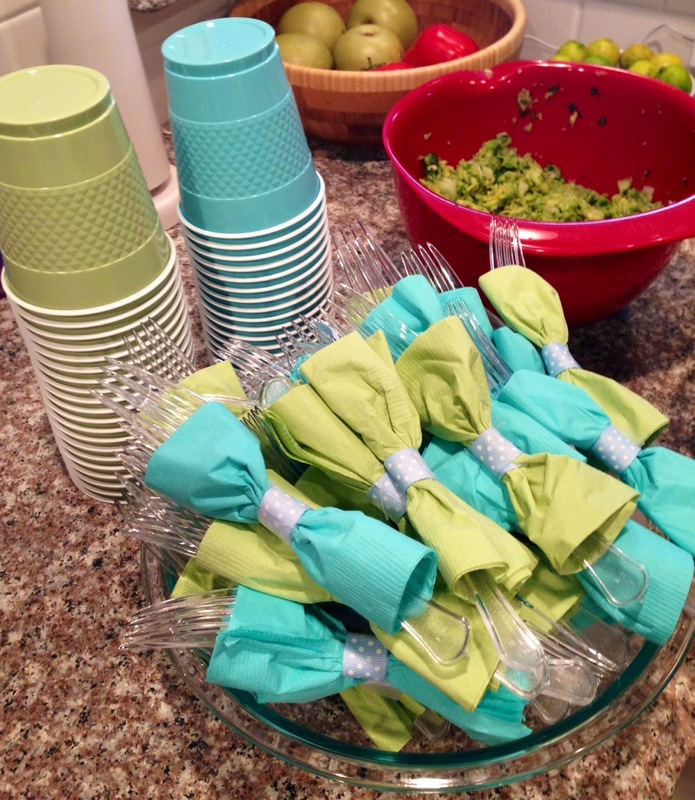 The classiness of this event is ranging from petit fours and custom cake pops to water balloons and drinking games. 'Nuf said. We've been busy around here! This week, my mother in law is visiting and has been helping me get some stuff done around the house. We have a great backyard, with an even better patio and pergola. While everything is very green, the space lacked some color. So one of our projects this week has been to venture out to get pots and flowers to decorate our patio space with - especially given our upcoming baby shower/housewarming party this weekend! 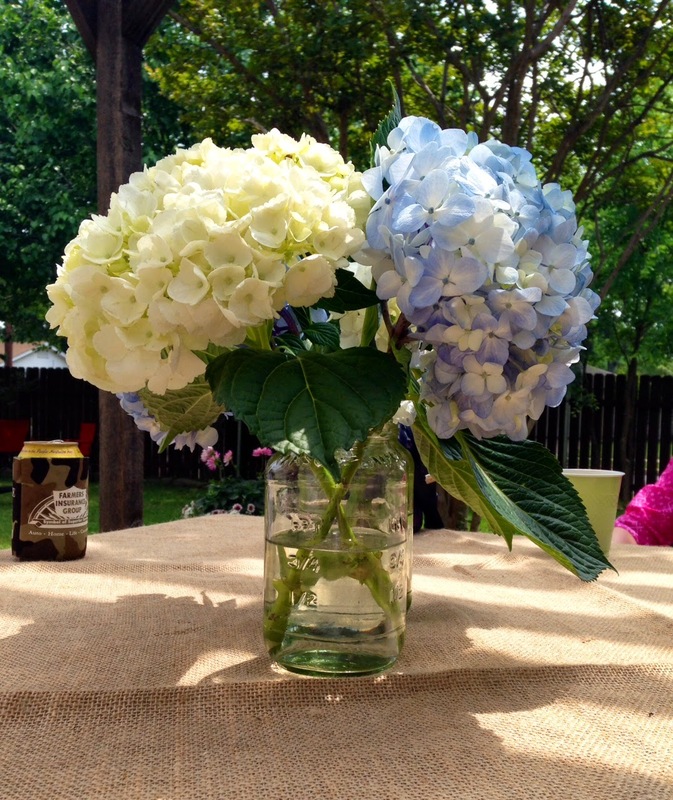 My father is a MASTER gardener. Their home in the suburb of Edina in Minnesota is immaculate, and every single thing - including the deck and the inlaid stone steps - was designed and done by him. My mom used to ask me to come over once a week to water her houseplants when she and her husband still had a home in Saint Paul, and were winter snow birds. I inherited none of my father's amazing talent, and usually killed all of my mom's plants. Fortunately, mama-in-law is talented in this area and came to help! We went to the nursery and picked out the pots, then were surprised with how few options we had for plants. We needed partial shade plants for where these pots would be located. Everything, and I mean everything, was for full sunlight. Which I just don't get in Texas! Full sunlight means these flowers need to be able to stand some 120 degree heat for hours on end. What plant can tolerate that nonsense?! 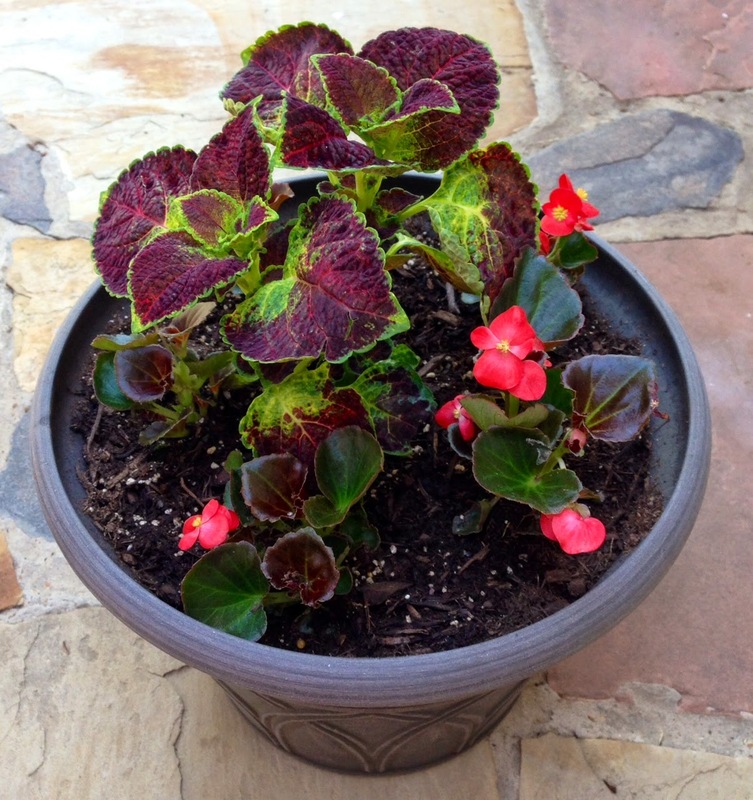 We ended up finding some begonias and some other type of plant that would do well in partial shade and went with it! She and I are used to northern plants and knew that there were a few more that would look great in the pot, but looks like those delicate little flowers can't take the Texas heat. I don't blame you little flowers, I just don't even blame you. Behold! Our work. Rather, her work. I'm pretty sure I sat at the table with my feet up and drank sweet tea. 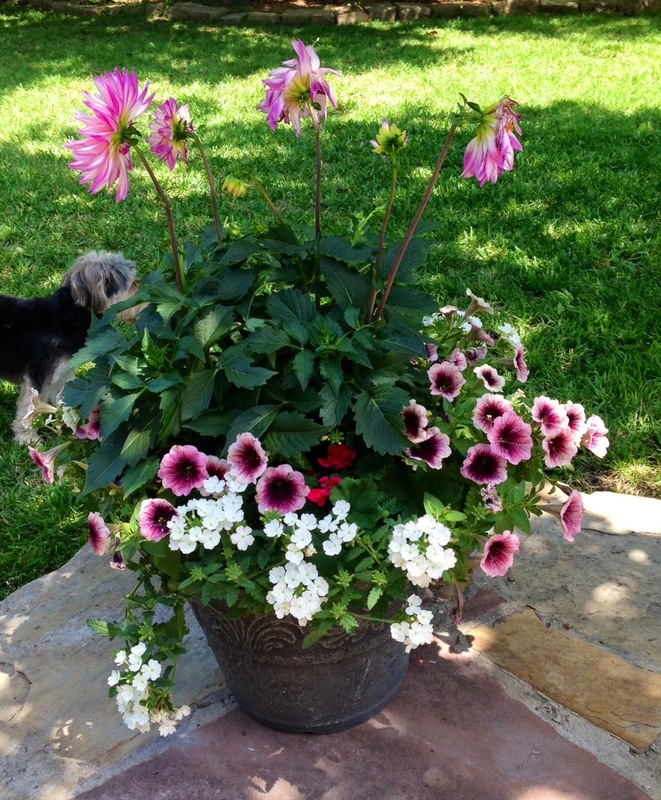 In fact, our doggies were more helpful than I was in the planting process. But she seemed to have it under control and since it was so hot out, I was happy to stay the heck out of the way with my pregnant toes propped up! Could NOT pass up this color! Kirk is going to be away on another one of his full-week territory travels, and after our preterm labor scare and the fact that I'm 33 weeks pregnant, we decided to have his mom come out to stay with me. 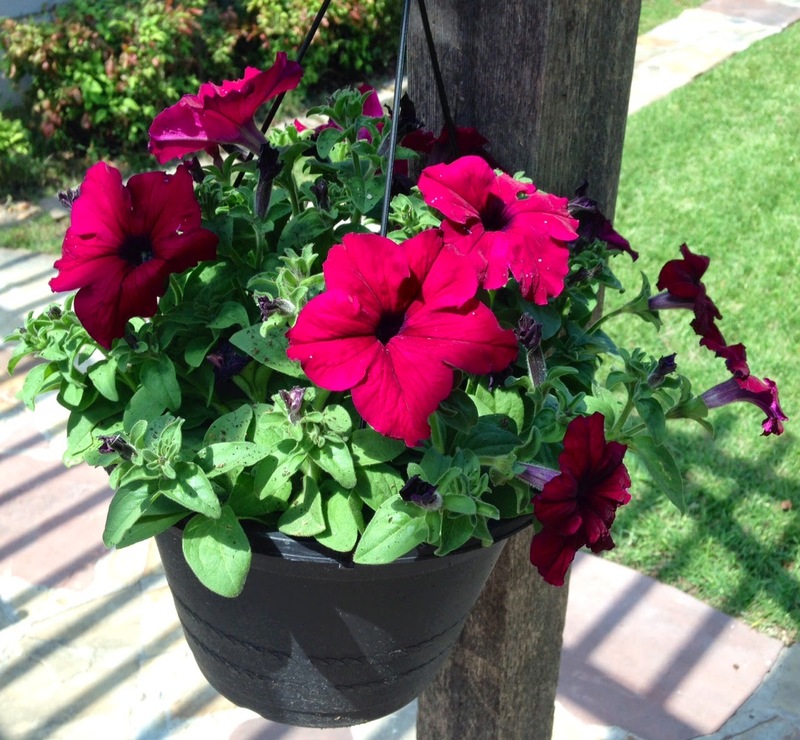 It's really good timing for both of us, actually, because I have a laundry list of things I need help with (planting flowers before it gets too hot to be outside! 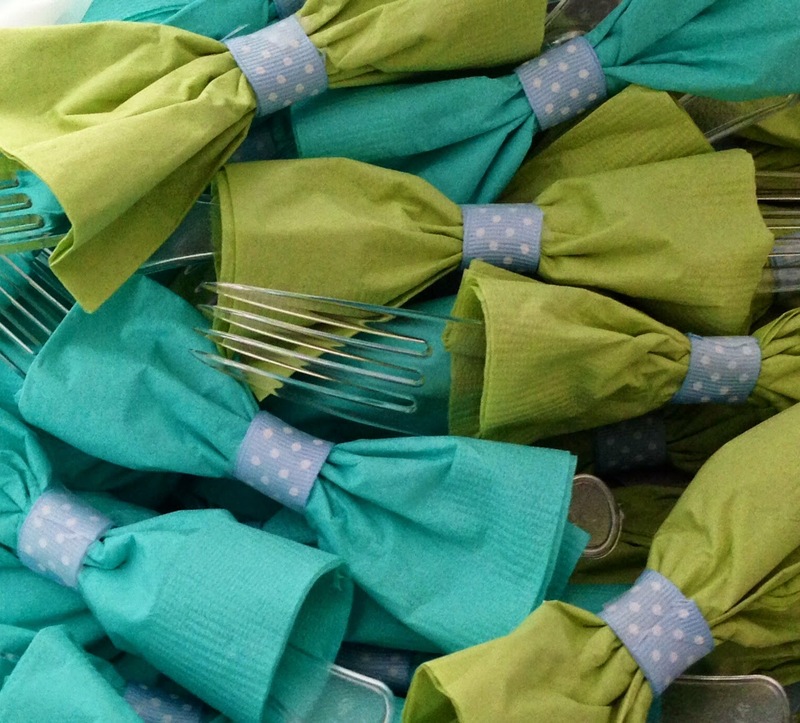 Baby shower prep for this weekend!) and she's sick and tired of the horrific North Dakota neverendingwinter. So she gets to enjoy some sunshine and I get an assistant! That means that I've been spending a lot of time prepping and creating lists, and not as much time blogging. In fact, cleaning ladies are busy doing their magic ALL OVER THE HOUSE right now since her flight lands in a few hours. I also have a terrible case of pregnancy brain. Like, can't function, forget-what-you're-doing-as-you're-doing it pregnancy brain. It's impressive. - Don't quote me on this... But... Maybe, just maybe, I've stopped HATING being pregnant. True, I can't move gracefully, can't go for a run in the final weeks of Dallas' not-too-hot-spring weather, don't sleep more than an hour before waking up to pee and am always, always too hot. But, you know, it's really not *that* bad! Maybe it's the fact that I officially had an "Oh, $&*!" moment when I realized he could be here in a month, or maybe it was the stranger I overheard at our Easter brunch say, "OMG, she's soooo pregnant and looks sooooo good! I hope I look that good when I'm pregnant!" But I've turned a corner with my bad attitude on pregnancy. It only took eight months. - The delivery date on our crib, mattress, and changing table has been moved up to mid-May! (It had been mid-June). So, seriously, we may actually have the nursery done in time. All future mommy's and daddy's take note: order that stuff E-A-R-L-Y. This is the crib we ordered. Pretty excited about it. LOVE that it's not your standard, run of the mill "white crib"! - I picked up a bunch of parenting books and am getting a head start on the first few months of baby's life. I also picked up Jenny McCarthy's Belly Laughs since I was getting sick of reading factual, advice-driven reads. While I think this woman is completely irresponsible for using her fame to promote a fictional connection between immunizations and Autism, the book is a quick and funny read on how gross pregnancy is. She really lays it all out there, and I love people who tell it like it is! High five for the funny book, Jenny, but you really do lose all your points (and then some) with your anti-immunization cause. - I seem to be on a massive fashion kick - not maternity, but I'm looking into all the fun things I can wear when I actually have a waist again... And noticed that PLEATS seem to be everywhere. WHAT THE FLYING HECK? Where have I been? Why is this happening? Pleats look good on no one. Pleats, ha! Are you serious? No. Nope. 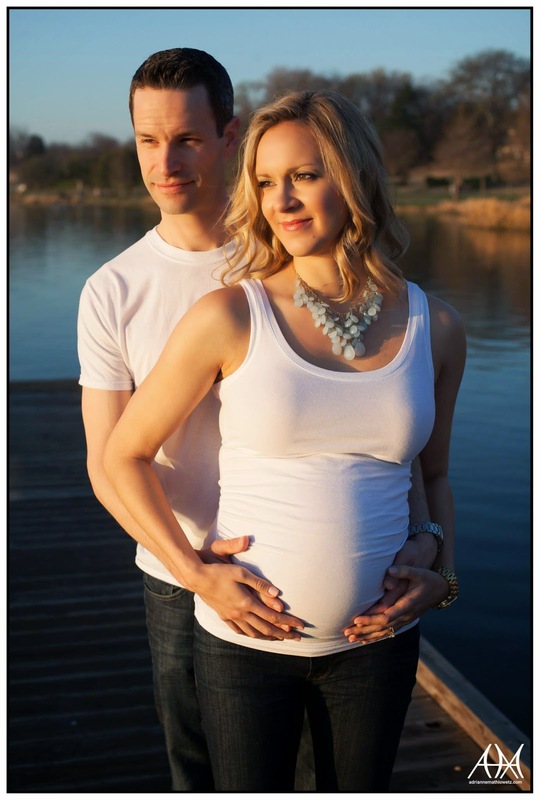 And finally, since posts are pretty bland without a good photo, here's one more of our maternity shoot! I'm currently trying to figure out which ones to hang in the nursery. This one is a contender for sure! Easter Sunday was just yesterday, and it seems like I know about five of us pregnant ladies who are all having our baby showers within the next three weeks. I mean, is it just me or is there just a massive baby boom going on right now?! Between Hollywood, acquaintances and close friends, I think I could easily name 50 women who are pregnant - and most of us are going to give birth before August. Craziness! Anyhow, with all these events comes a reason to dress up a bit. I have NOT gone crazy with the maternity wardrobe. In fact, I've only splurged on two pairs of designer jeans and one pair of designer shorts (I mean, I live in Dallas... It's hot already!) and then have picked up one tank top and three tee shirts. That's it. That's all. Needless to say, I had NOTHING nice to wear to any of these events. No skirts, no dresses, not even a nice top to wear! I ventured out in what started as a pregnancy/parenting book buying binge, and wouldn't you know, a Pea in the Pod store was right there. So, I went in to see what I could find. I've been searching for a maxi dress that I could dress up for nicer occasions and still wear out to the grocery store. The thing is, when you're 5'10, maxis just aren't cut out for you. Literally, they're built for someone who is only about 5'6! So they end up just looking a bit... Amish. You know, hitting mid shin and awkwardly hanging on your tall frame? If you're tall, you feel me. What I love about Pea in the Pod is that they carry brands that dress women of my stature. What I don't love is the high price. Thus, my first look was this awesome grey and neon yellow stripped maxi from Nicole Miller. I loved it on the hanger, and I loved it on! She figured out a way to use darts and rouching creatively to hide any chub you may or may not have developed in your pregnancy. The colors were awesome and a size small was LONG ENOUGH FOR A 5'10 WOMAN! Whoohoo! Not "able to wear heels with it" long enough, but beggars can't be choosy, and I was beggin' for a long enough maxi. Shot I sent my sister-in-law (mama of three) as I desperately tried to decide if this dress was worth $275... Oh, the things we do for fashion. While I looooooooved the dress and how comfy it was, I just couldn't swallow THAT price tag. This is the first of what will hopefully be more than one pregnancy; so clearly, if I purchased the dress thinking I could wear it again, all my future babies will be winter babies. I decided to look on. Except, I wasn't really finding anything. I picked up two shirts I can dress up or down and another pair of shorts (I mean, when you're this pregnant you have to sit with your legs separated a bit to make room... Add living in one of the hottest states in the Union, and shorts are the friggin' bees knees, y'all!). The sales associate must have sensed that I was preparing to leave without spending $2,384,129 so she pulled a few more maxi's for me to try on. "Uggghhhh, she's so annoying!" I thought. "These dresses are NOT cute and I have to be at my birthing class in an hour. Boo." And then: I tried this maxi from Tart on. The heavens opened up and angels started to sing, I swear! It is SO comfortable! Because of the print, I never would have chosen it off the rack for myself. 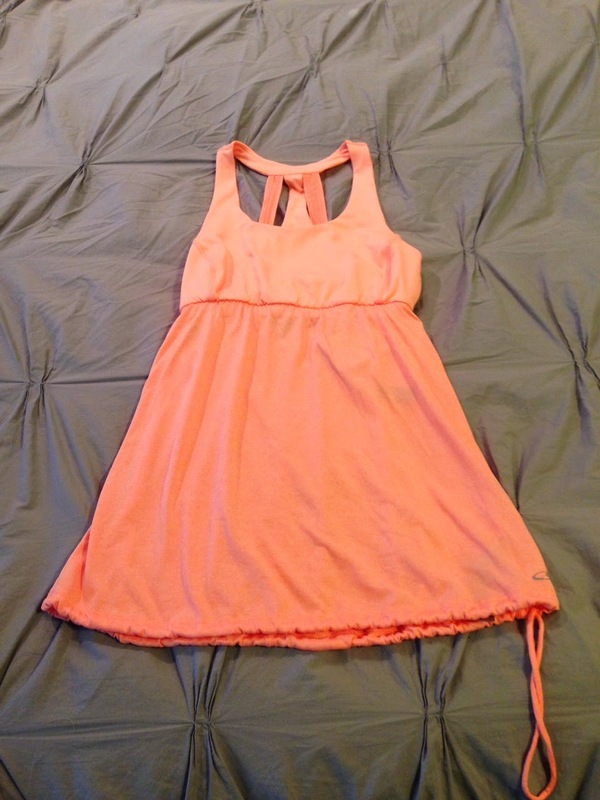 But it's insanely flattering on, and will easily be dressed up or down. Also? A size small is LONG ENOUGH FOR A 5'10 WOMAN! Can I get a "hell yeah!" from all my other tall mamas struggling to find tall maternity clothes?! In addition, not seeing a "2" as the first number helped me swallow this price tag much easier than the Nicole Miller dress. 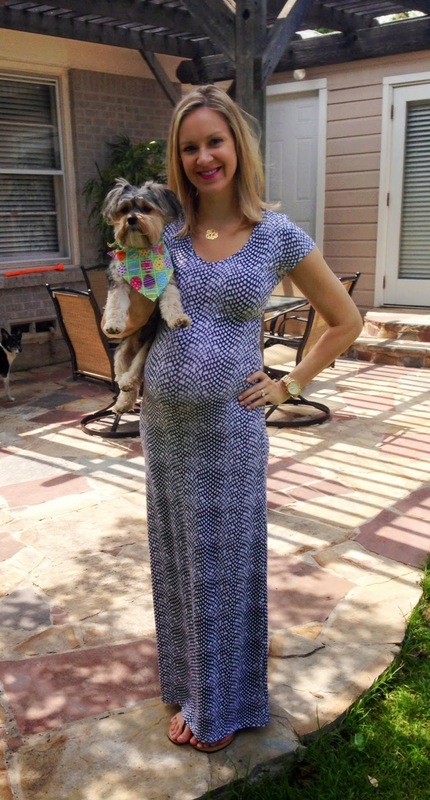 Otis Beaufort and myself on Easter Sunday in my Tart maxi. I kept it casual in sandals and my standard gold jewelry, but nicer shoes and heavier jewels will dress it up in a snap! I've come to the conclusion that two things are worth a good splurge when you're pregnant: designer jeans and a good quality maxi! If you're not Jolly Green Giant tall like myself, you can get away with not selling an organ to afford one. If you are, trust me: Buy one! Just make your life easier and do it. I pretty much plan on living in this thing until baby comes. 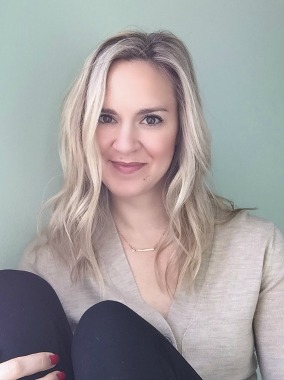 What you want to do with the rest of your maternity wardrobe is up to you, but these two items will make a world of difference for you, your self esteem (as you grow... and grow and grow and grow), and are flexible pieces to keep in your closet. I seriously feel like I was just sitting down to write my last H54F post. These weeks are just FLYING by! Which is funny, because when I'm pacing the house with terrible heartburn or climbing into my second bath of the day in attempts to ease the massive hip pain (you know, they're just doing a little expanding for baby. So, that's depressing), there would be NO WAY you'd be able to tell me about how fast time flies. 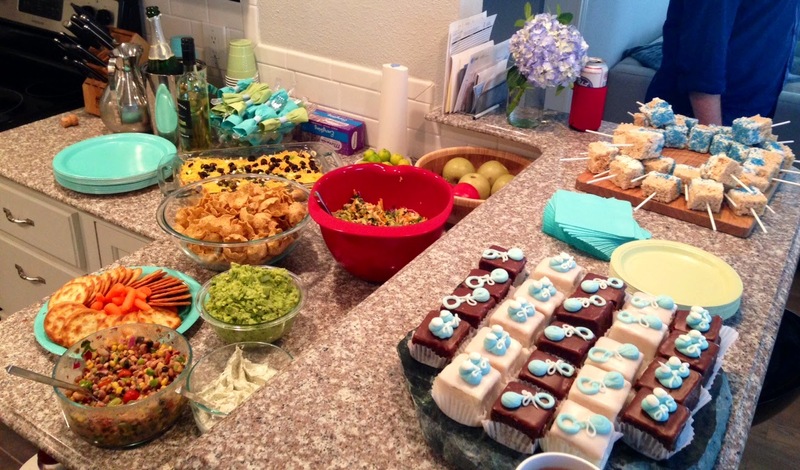 1) I talked here about how Kirk was making some special "healthy" dessert bars to bring to our birthing class. I'm happy to report that the second attempt was a win, and everyone in our class was impressed that a husband actually brought something homemade for the group to enjoy. Kirk was pretty proud of himself, and I was impressed too. In fact, I couldn't even snap a quick pic, they were gone that fast! 2) I have resumed a four day a week yoga practice. Ohhhhhh, my, y'all does this make a difference in how I feel!! The sun is shining, the birds are chirping, and the days that I get to move and stretch are filled with glory. Read more about it here, and if you happen to be pregnant, take up a practice of your own. Fo realz. 4) While it was ABSOLUTELY delicious, I have officially overdosed on banana bread! It has been my breakfast and a good portion of my snacks for nearly every day this week. 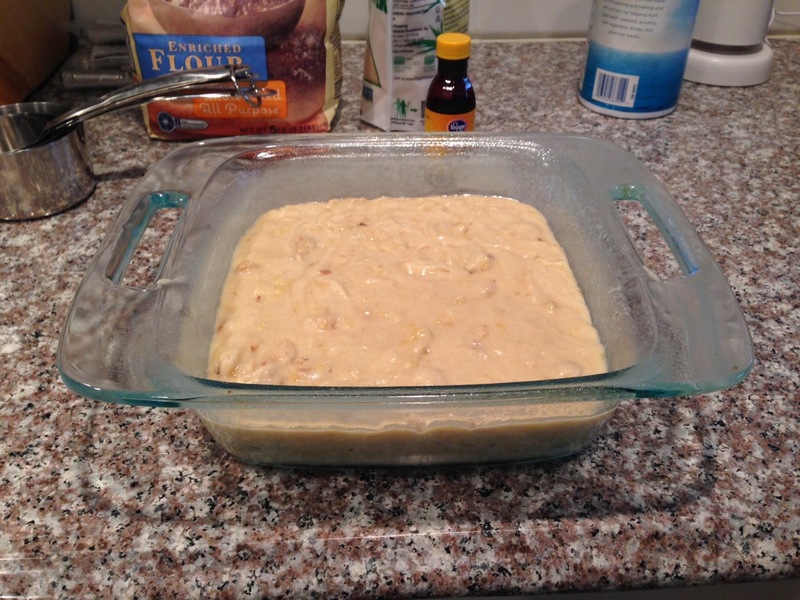 So, my banana bread craving should be satiated for about, oh... A good week or two :) Want the recipe? Check it out. 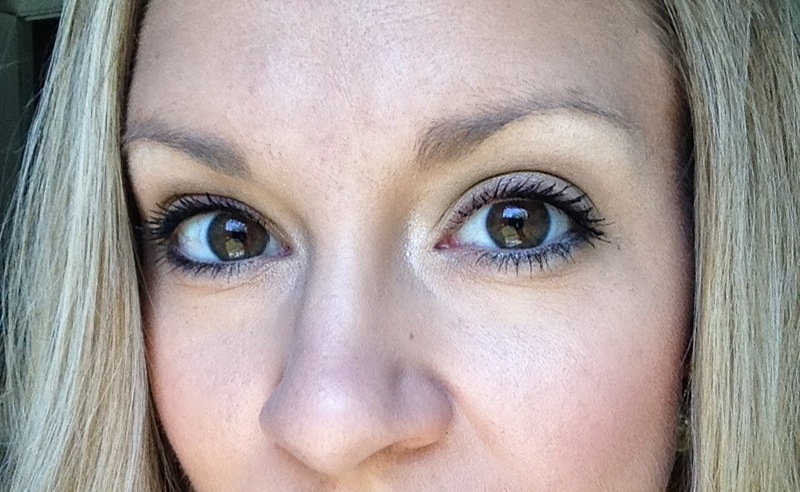 5) The day I posted this about my Birchbox subscription and Inika eyeliner, I got my April box! This one was full of goodies, so I'm really excited to get to tryin' them all! No makeup in this month's box, which I actually prefer - it's really tough to send out makeup samples that flatter a specific woman's skin tone. I really lucked out with the eyeliner. I thought it was going to be a ridiculous shade of green, but it wore beautifully and was a perfect match for hazel eyes. It's been added to the regular rotation! Here's to hoping everyone across the country gets their turn with spring! Cheers to the weekend. Well over a year ago, I signed up for Birchbox, which is box of beauty/hair/skincare/makeup products that gets delivered to my door each month. You fill out a profile in your online account, and they select about five trial sized, non-drugstore brand (read: nice stuff) items to send you each month. It costs a whopping $10, which is great, but the thing I like best about it is the exposure I get to various new products without having to shop! In fact, I don't even need to think. I just get to open the mail and play! After the eyeliner sat on my vanity for several weeks, I decided I needed to try it and either keep it or toss it. It IS certified organic, so you know it had my name written all over it. It was just... So... GREEN. Bright green. Almost a blue-green. I mean, look at how green that is, right?! 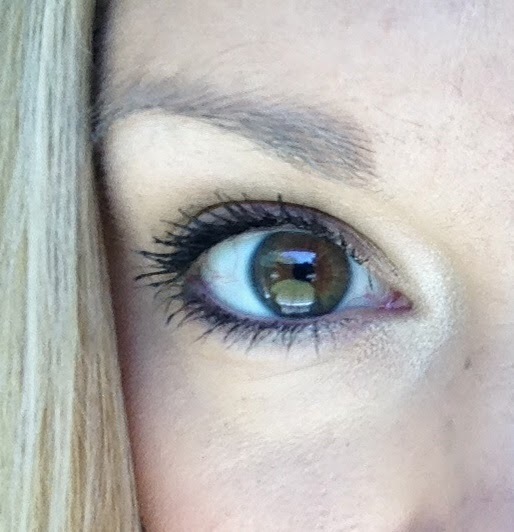 I have dark hazel eyes made up of grey, green and brown, so I usually enjoy green to bring that color out in them... But this looked a little "Jersey Shore" for my taste. "Oh well, let the beauty salon game begin!" I thought. Can I quickly note that I decided to play beauty salon shortly before I headed over to the Texas DMV to get my license updated with my married last name? Down here they take a new photo for every I.D. issued, so... That was a dumb risk to take! I took this SUPER close up so that you can see the eyeliner doesn't apply anywhere near as obnoxiously bright as it looks in the stick! I used a deep brown shadow liner on my upper lid and used the Inika eyeliner on my lower lid. Paired with a deep, earthy green shadow in my crease and a taupey-brown shadow in the outer corners of my eyes, I think the "Green Lagoon" actually makes my eyes pop nicely. 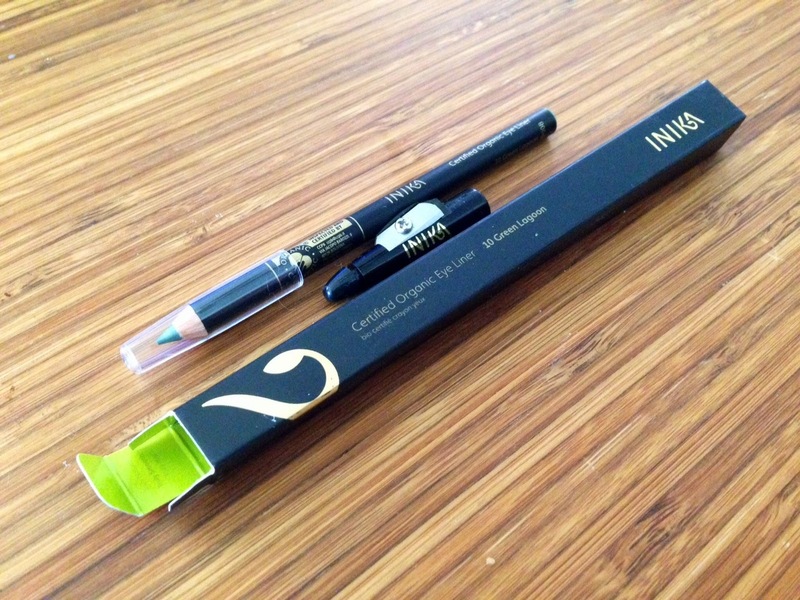 If you click the link for the eyeliner, you'll see that Inika offers a number of colors of this product. So, if you have blue, brown, green, or a different shade of hazel than my eyes, you'll be able to find something to make your eyes pop too! It comes with a sharpener in the lid, and I always appreciate clever packaging. 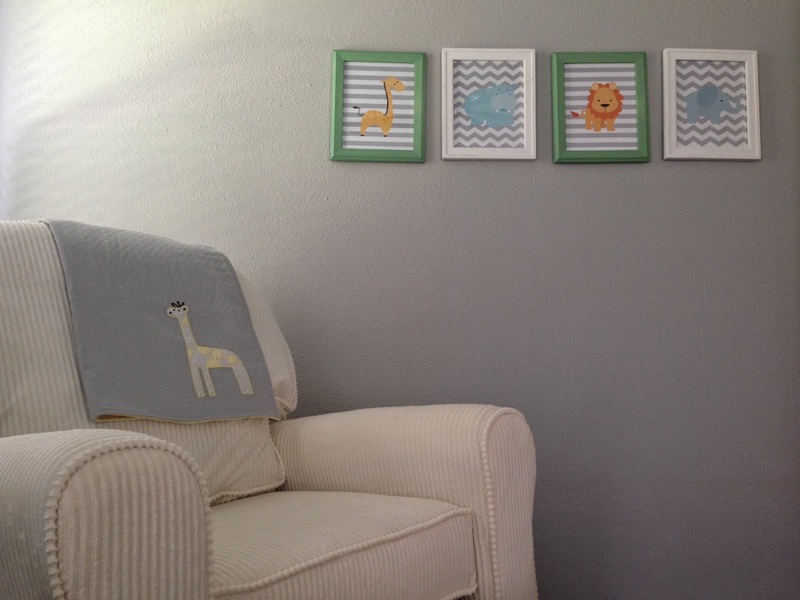 I made mention in this post that we had made some major progress in the nursery. Several weeks ago now, we realized that we had done absolutely nothing to prepare for this baby outside of picking out our midwives and going to prenatal appointments. So we shifted into high gear and started to get our act together... You know, since he's scheduled to be here in less than eight weeks. Oops! As I mentioned, I think it's important to have a calming space for a newborn. Little baby had to endure a lot of trauma to enter the world (hey, whoa! So did mama) and they just excited the only place in the world that would provide consistent, perfect climate and care for them (you know, the womb). So I'm not a real big fan of bright colors and loud prints in a nursery - I want to keep it as calming and comforting as possible. As you can see, I've kept up with the neutrals, soft greens and blues. Oddly, it's been extremely easy to find this shade of green everywhere. The chair-side table was found on overstock.com; the shelf is from Home Goods; the safari prints in the frames are from Etsy; the monogram letters I made myself with supplies from Micheal's; the elephant light is from Pottery Barn Kids off our registry (thanks, mama! 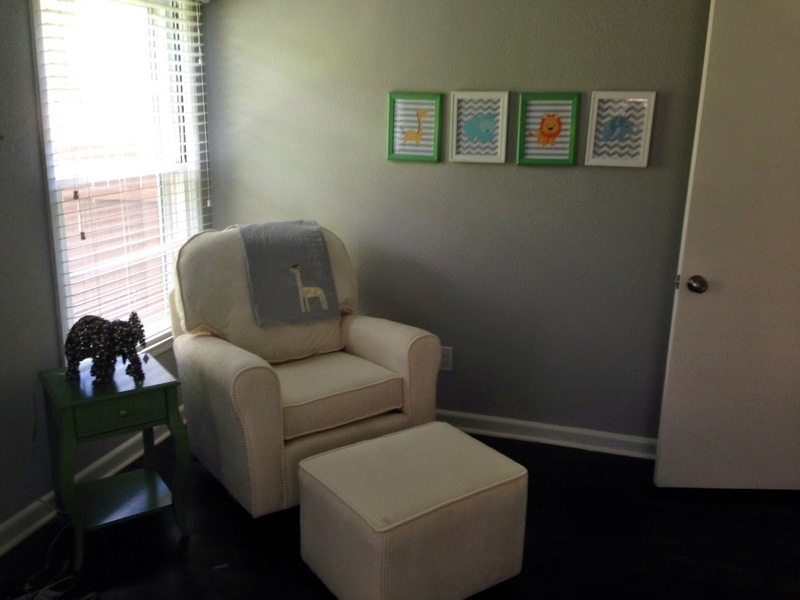 ); the grey giraffe blanket is also from Pottery Barn Kids; the chair and gliding ottoman are from Babies R Us. Outside of that, we're ready! Now. We just need to get prepared. Nobody around here is prepared, I can tell you that much. I have a massive pregnancy sweet tooth. I try to keep it in check and only indulge in sweets a few times a week. But wouldn't you know, we just so happened to have three overly ripe bananas sitting on our counter, and banana bread just happens to be one of my favorites! Clearly, the only just and fair thing to do was make some banana bread to serve those ripe bananas justice. Justice straight to my belly. Anyway, I mentioned here about how I'm an absolutely terrible baker! I hate following recipes exactly, and since baking is a chemistry, one must follow it just so. 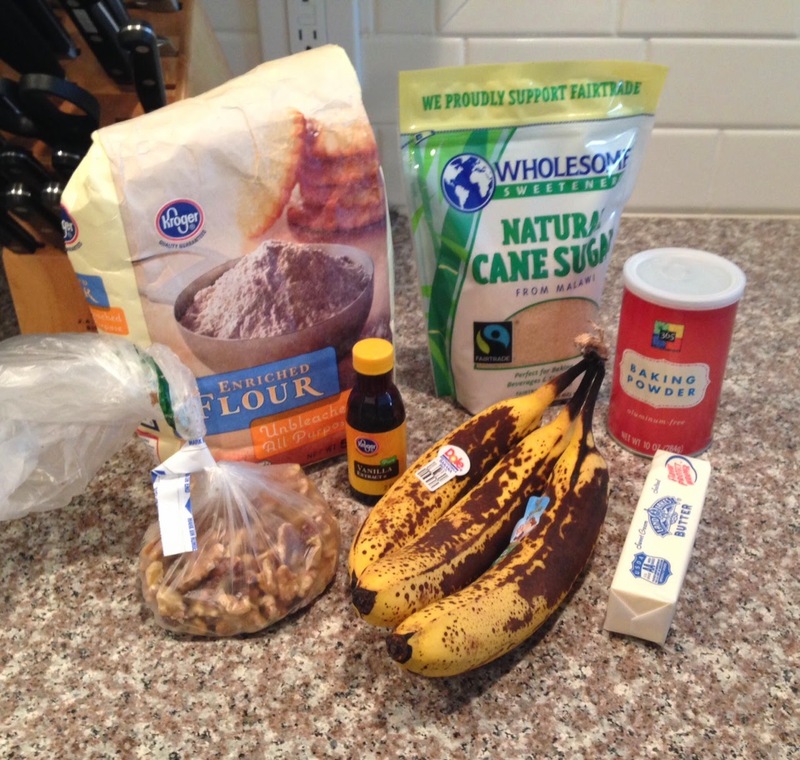 But dangit if I didn't want some banana bread, and I had everything I needed to make it already (kinda) and the justice for the bananas, y'all! I thus embarked on my baking adventure. First, I lined up everything I would need to put it together. 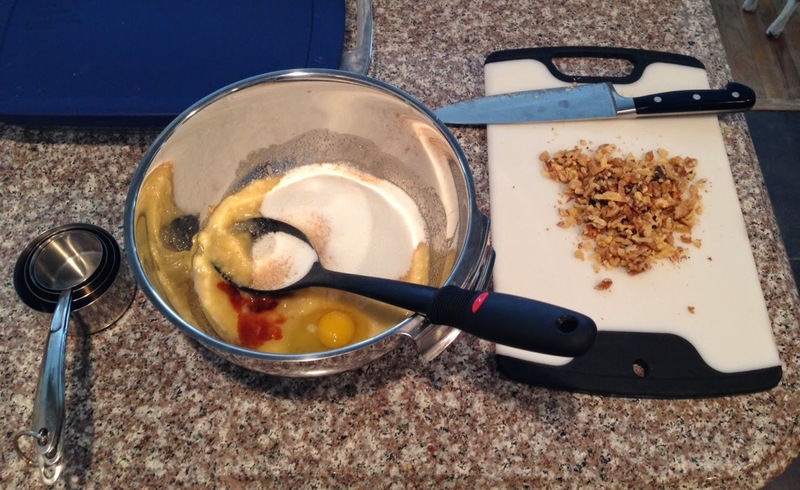 That shot forgot the eggs, and eggs are definitely involved in all baking adventures. So I grabbed the eggs, and started to mash up the bananas. 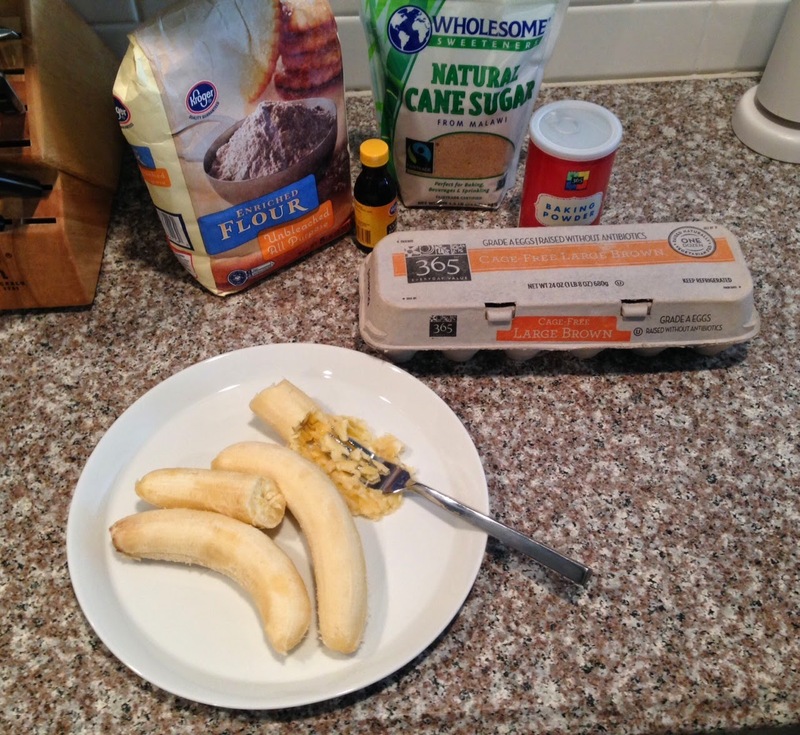 When your bananas are super ripe, it's easy enough to smush them with a fork - no need to bust out the food processor! Yessssss, fewer dishes to deal with. After mixing in the salt, I realized the recipe called for baking SODA and I had baking POWDER. Oops. Oh well, it was close enough! So then I realized I couldn't find my teaspoon - only my tablespoon. Meh! So I added a not-quite-full-tablespoon of baking powder, which was not part of the deal. Then the flour and walnuts. I didn't even measure both of those... After my soda/powder debacle, I was quickly growing tired of this baking nonsense. Baking fail. It was looking and smelling good at this point, and looked like most banana bread batters I've seen before despite my lack of measuring. However, my next folly was that I didn't have a friggin bread pan! Since I don't bake, I've never bought one and didn't put one on my wedding registry. I DID put a sweet set of Pyrex baking dishes though said registry though, so I I figured that would do. 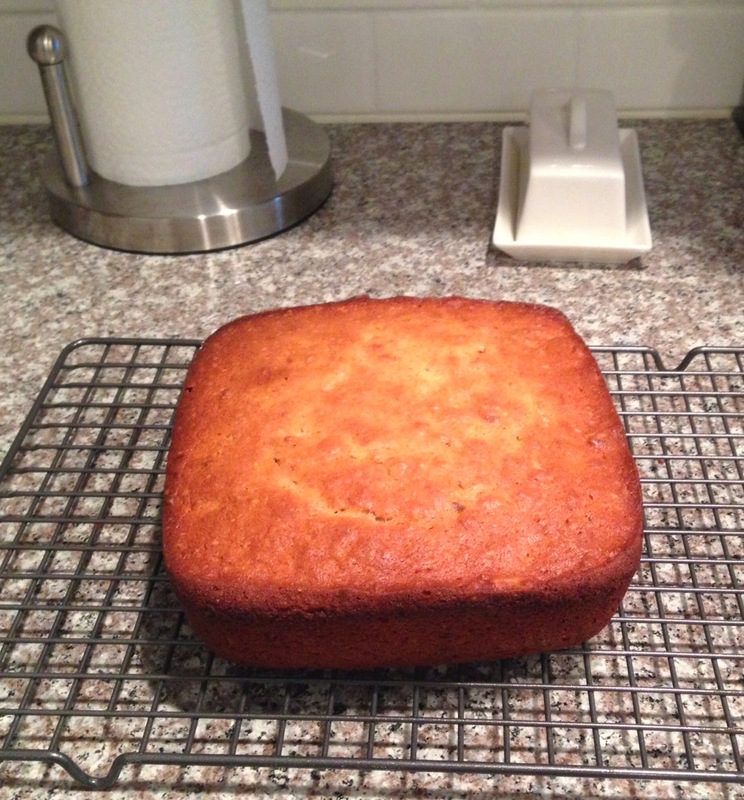 Low and behold, the not so perfect, slightly altered, non measured and non bread pan banana bread! I put that bad boy in the oven and stared down the batter encrusted bowl... Now, I *know* pregnant women shouldn't eat raw dough because of the eggs in it. But this is per the FDA, the same federal bureaucracy who tells pregnant women diet soda is "safe" to drink throughout their pregnancies (UMMMM, it's not safe to drink, ever) and I had just got the eggs and heck they're pasteurized anyway, and my belly was screaming JUSTICE PAIGE JUSTICE!!! So to hell with the FDA. 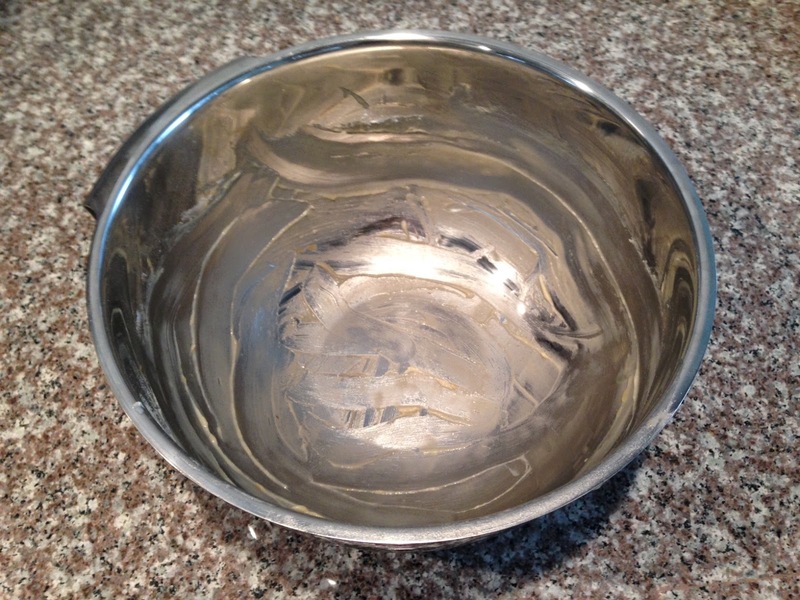 I licked that bowl CLEAN. And it was amazing. The bread itself was equally amazing. Voila! Le pain est fini! In all seriousness though, this bread was fantastic, it was easy to put together and forgiving of my inability to properly bake, and Domestic Superhero is a pretty fun read too. When you have (or, errrr, had...) a body that is in continuous motion, it gets "shocked" when it becomes consistently still. After a week of bed rest, my hips and back ached, my restless leg syndrome was off the charts, I was agitated and to be perfectly honest, I was just plain old mean! 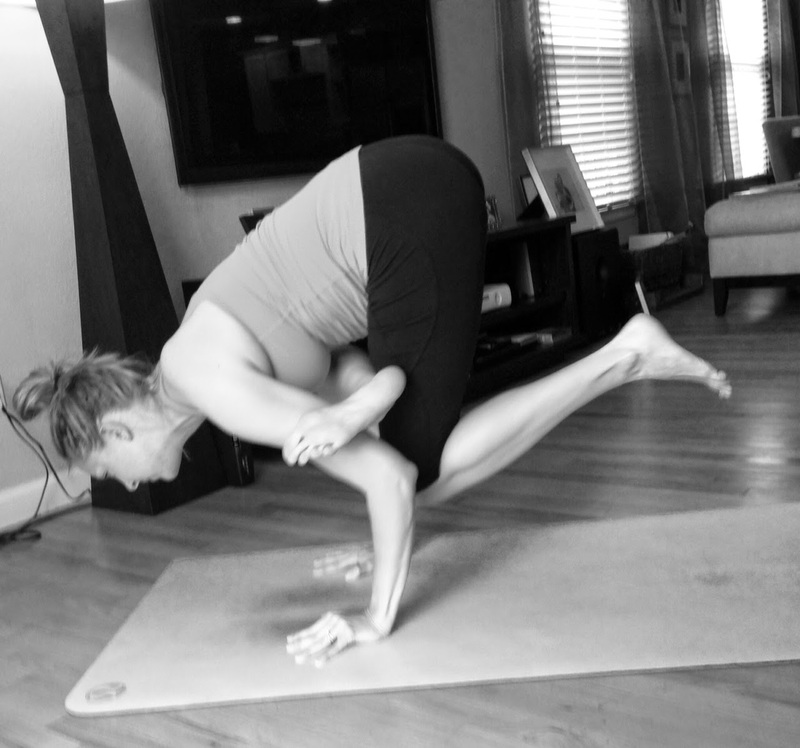 Since my contractions had completely stopped for over a week, my midwives said I could go to prenatal yoga classes. Yes, movement! I knew it wouldn't be the same as a regular yoga class, or a good run, or a circuit training class, but I was so excited for the opportunity to move and get on a mat again, I didn't care. So I went. And I was right. It was very gentle. Mostly stretching. No cardio or "flow" of a typical yoga class. No long holds of poses, no extreme strength moves. Not even any sweat was produced. But it was the best hour and a half I've had in a long, long time. Clearly, the class is full of other pregnant moms, which built an instant sense of community in the room. We started the class going around an introducing ourselves, saying how pregnant we were, and listing any particular body part that was especially nagging us. The bulk of the women were between 25-35 weeks pregnant (one woman came on her actual due date! Get it, girl! ), with a very small handful of women in the 13-18 week range. Hips and low back was a common body part cited that needed relief. Now, if I had taken this class prior to my preterm labor situation, I would have been annoyed and frustrated with how slow it was, how I wasn't working up a sweat, and how I wasn't engaging enough muscle groups. Now that my perspective has been entirely changed, prenatal yoga classes are the highlight of my week! The instructor was kind and assisted any woman who needed help with a pose. Nothing about any of the poses was challenging or would remotely put any woman in any sort of risk in her pregnancy. All the poses felt wonderful, and stretched what pregnant women need stretched, focused on the breath and relaxed us. We focused on stretching and strengthening our hips and low back - no shocker there. But last night (my fourth prenatal/gentle yoga class) we spent a lot of time opening and stretching our ribs, chest and heart. I had been feeling like my lungs were cramped and breathing hard for most of the weekend, and after this class, I felt about ten pounds lighter and found it much easier to breathe. I'm not kidding! I cannot wait for my early afternoon class today. Who knows what will get worked on that I didn't even know needed some attention? Sadly, prenatal yoga is NOT cheap. At my studio in Dallas, it's $135 for 10 classes, and individual classes are $15 each if you don't purchase a "package." Expect to pay roughly this, with national pricing ranging from $12-$25 per class. Water bottle - even though the room is cool, you'll want to drink lots! The yoga studio will likely give you some props to use while in class. These typically include cork/foam blocks, sturdy wool blankets and straps (used to assist flexibility around your baby bump). The instructor will tell you what prop is appropriate for which pose, and inform you how to properly use each one in that pose for your (and baby's!) safety. - If you didn't have some sort of a workout practice pre-pregnancy, or weren't consistent with anything, it is 100% worth your time and money to begin prenatal yoga classes! Do yourself and your baby a favor and begin going to a few classes a week. You'll notice a reduction in aches and pains, and begin to focus your breath for pain management during labor. There are also numerous benefits to your baby when you exercise while pregnant. Read this article if you need further motivation to have an exercise plan throughout your pregnancy! - If you're struggling to keep up with your pre-pregnancy workouts, have some undesirable symptoms (round ligament pain anyone? ), or have been told to scale back your workout efforts, start going to prenatal classes in conjunction with a few of your "old" workout habits. The prenatal class will seem like a nice break and breath of fresh air, and work to stretch any sore muscles you developed in your normal workout. As you get more and more pregnant, consider dropping more and more of your former workouts to include more and more prenatal yoga. It will help to maintain the shape you were in pre-pregnancy without exposing you to any risky situations. And it just feels so dang good. Bottom line: just go! You will not regret it. Just a little bit of a contrast from last week, y'all. 1) We made some serious progress in the nursery! There is now actually some furniture in there, there are things up on the walls, crafts have been completed, clothes are hanging in the closet, and the delivery date for the crib and changing table has been moved up by a week so that it just actually might be here in time for his arrival. Who knows, I won't hold my breath on that, but time shall tell! 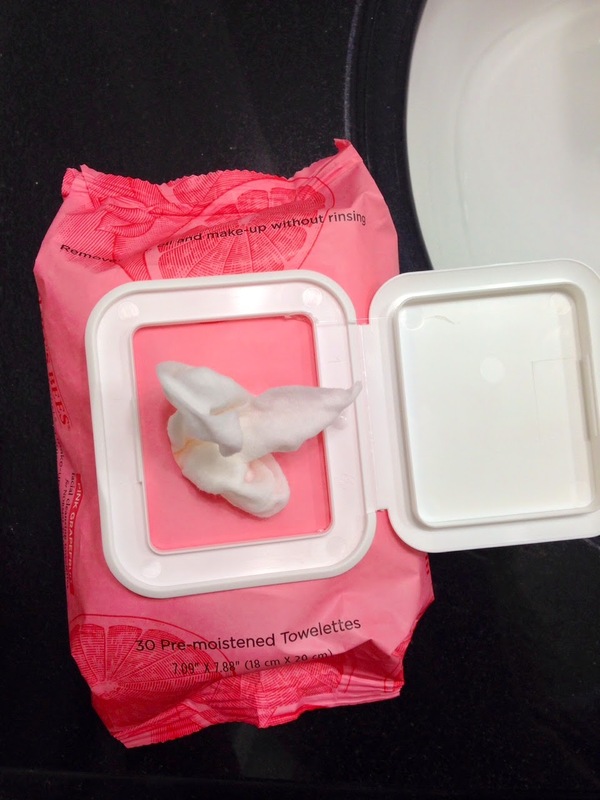 I had another brand of cotton pads that were ok... They were much, much thicker, and frankly there just isn't room to put that level of padding in ye ol' bra! These are fantastic. 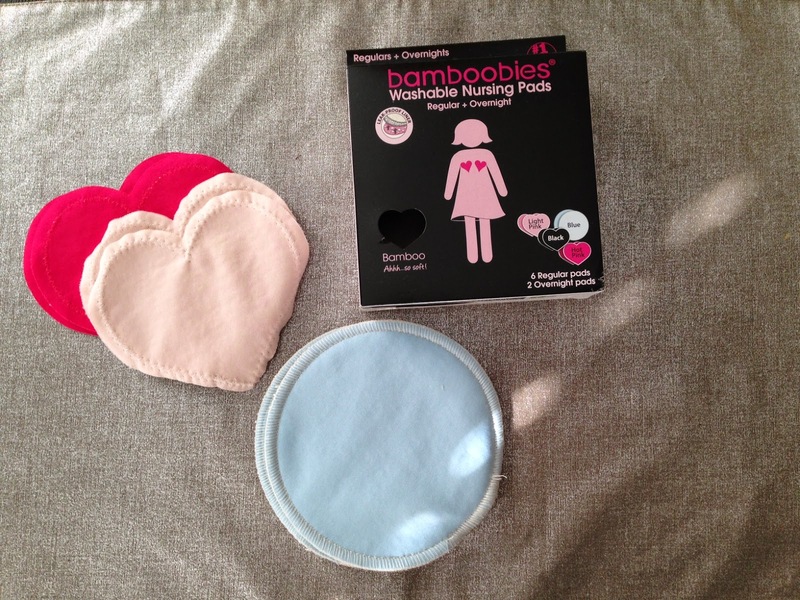 The heart shaped pads are thin and perfect for small leaks that are often experienced in the third trimester. The round pads are thicker and described as "overnight pads" which will come in handy after I start nursing. They're made from bamboo, so they're extremely soft. They're washable so you can use them over and over, and the heart shape is not only cute - it's functional by wrapping around the shape of your chest. 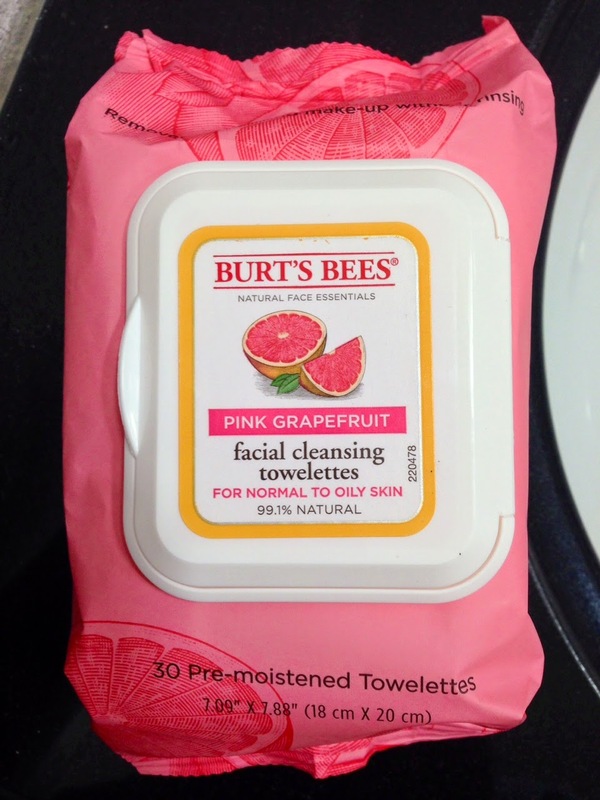 They were quite a bit more expensive than the cotton pads I initially tried, but SO WORTH IT. I learned they make nursing bras and I just ordered one. I'll let ya know how it is! My order was processed and shipped within a few hours, so I'm impressed thus far. 3) Kirk had an especially long week of travel, so I've been flying solo since Monday morning. Two of my favorite ladies in Dallas came over on Tuesday evening to keep me company (and bring me dinner)! It was a fun evening spent on the patio, enjoying the beautiful weather, drinking wine (or salivating at it, anyway), and talking about security systems. Yeah, we did that. 4) Have you ever moved, and packed something in a strange place last minute, then been completely unable to find it afterwards? I had misplaced the book I was reading since we moved in late February. I looked IN A SUITCASE, of all places, and found it! 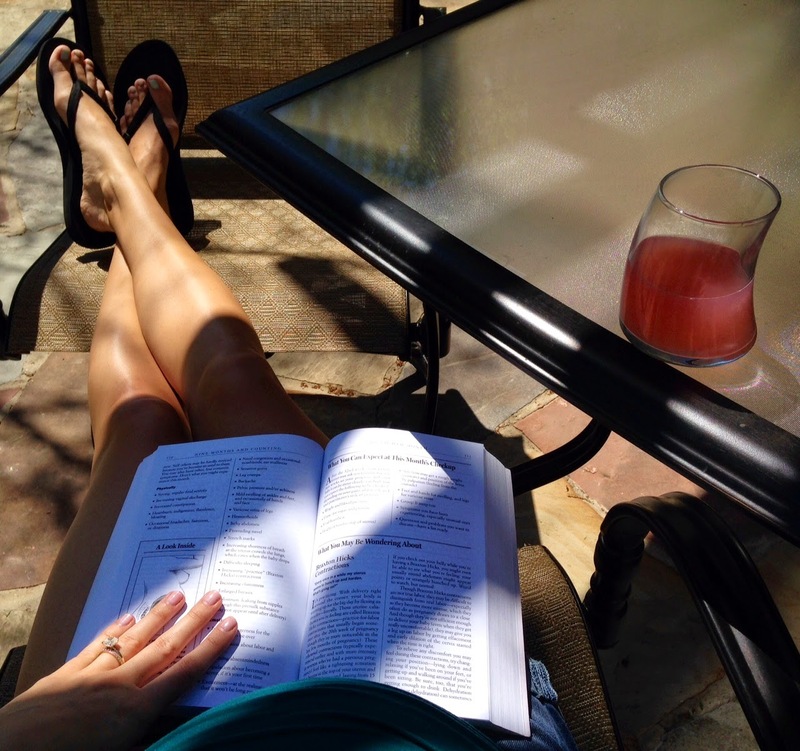 So I was able to spend some of my alone time this week enjoying the insanely gorgeous north Texas springtime, catching up with my book and enjoying a glass of raspberry lemonade. Cheers! Yes, it's a pregnancy book. Yes, the baby likes to hang towards my right side. 5) I mentioned a few weeks ago that we had started our "natural birth" birthing classes. Now that we're a few weeks into them, we've been surprised at how much we're enjoying them, and really enjoy the company of a few of the other couples - we even look forward to the three hour class smack dab in the middle of our Saturdays! We're asked to bring a snack to share given the length of the class, and last week Kirk wanted to make a special "healthy" dessert bar. He looked up a recipe for these bars, picked up ingredients at the store, and was fixing to make them when I meandered over to the kitchen (am I alone here, or can you just SENSE when bad things are going down in your own kitchen?!) I find my husband pouring corn oil into a pan. A lot of corn oil. "Honey... What are you doing?" I ask. "It says to melt the sugar in the corn syrup, so that's what I'm doing" he replied. "Ummm, then why are you pouring oil into a pan?" I ask. "No, I'm melting sugar into the corn syrup!" he defended, clearly annoyed that I was checking up on him. "Honey. That's corn OIL. Corn syrup is completely different." "What?! No. This is what it says to do!" he said, wide-eyed and realizing things were going quickly awry. "Babe, you CANNOT substitute corn oil for corn syrup..." To which my sweet hubby lowered his head in defeat. We did not bring a snack last Saturday, but after a trip to the store, I ensured he has everything he needs to make these "healthy" dessert bars for our group. Don't worry, I'll be keeping my ears open and half an eye on how round two of preparations proceed! I'm also pretty impressed I was able to completely avoid the bag of butterscotch chips he purchased to go into these "healthy dessert bars" since butterscotch IS MY JAM! It's my thang. Mmmmm, butterscotch! But he was so distressed about his blunder, I couldn't disappoint him by eating the dang butterscotch chips, ya know? HAPPY WEEKEND TO ALL, AND TO ALL A GOOD WEEKEND! I am NOT a bargain shopper. I am NOT a good-deal hunter. I am not, even, a "shopper" at all. When picking out things for myself or gifts for others, which historically has been my only experience with shopping, I know what I want, I don't want to dig through piles of junk to get it (I enjoy a nice experience and will pay to have a nice experience) and I want out of the store as soon as I pick it up. My snobby shopping philosophy does not hold true with baby items. Gasp! Am I turning a new leaf? Here's the deal: this little guy is going to grow like crazy. He's going to poop on things, including his clothes. He's going to spit up and vomit on them. 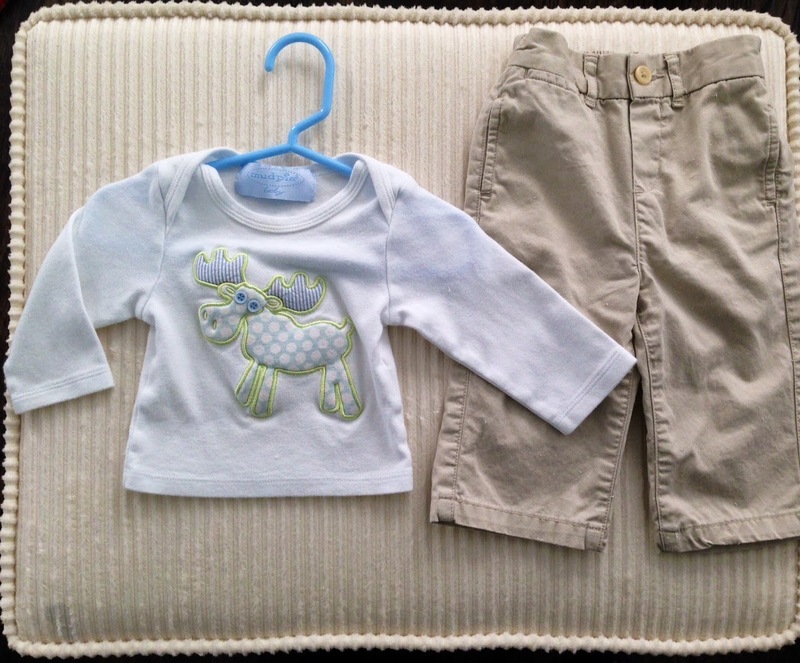 So in my eight-months-pregnant-nesting phase, I just COULD NOT EVEN with paying full price for baby clothes. And the name brand/designers I love? No way! This does not change the fact that I myself enjoy nice things. But I'm done growing and believe in buying quality over quantity because I won't wear the knees out on a pair of Hudson jeans... I will wear them for years and years. Baby will wear them once, vomit on them, and the next time I go to put them on him, they'll be too small. Hmmpppffff! So what's a quality snob to do when she can't seem to justify the enormous expense for baby? (And y'all. It is ENORMOUS. 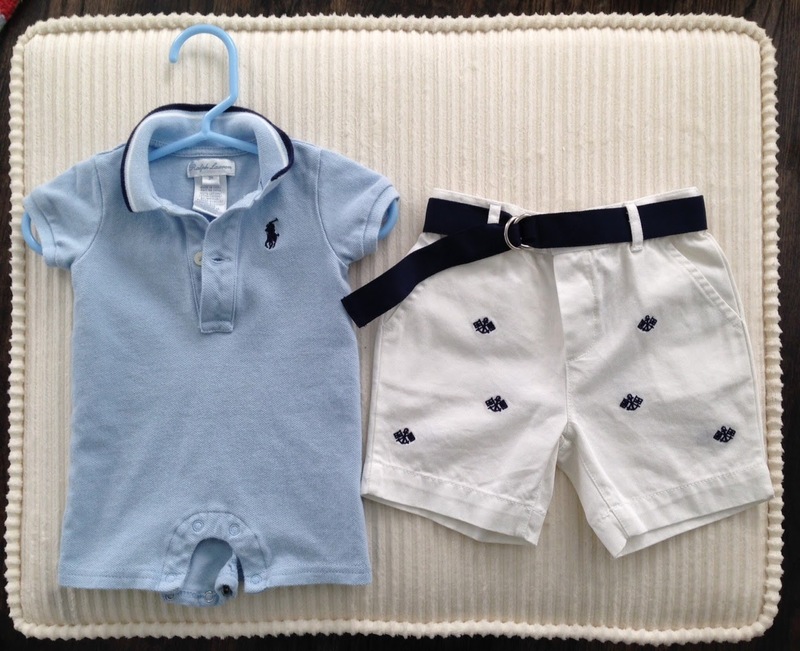 $40 for a 0-3months-sized polo shirt?! Is that some kind of joke?) Church consignment sales! This past weekend, my friend Kate introduced me to this glorious find. We met up at The Church of Christ in the Preston Hollow neighborhood of Dallas early Saturday morning to hit up this sale. She discovered it last year (she has a beautiful one year old daughter) and has been talking about it for months now. I was so desperate to get an hour out of the house with my bed rest nonsense that I jumped in the car and headed right over. Here is how the sales work: folks can either donate the clothes to the church, and the church collects the proceeds as a fundraiser. Or, they can decide to sell it on consignment, and a fraction of the proceeds go towards the church while the seller gets a premium for the garments. Either way, the church gets a fantastic fundraiser and the donor either gets cash from sales or a tax deduction for the donation. Win-win! But the BEST part?! Is that the shopper gets access to all these high end label clothes for DIRT CHEAP. I didn't pay more than $3 for any one of these items. The shorts and the diaper cover even had their original tags, so they had never been worn! The other items looked as though they had been worn once - maybe twice. I ended picking up roughly 20 items, ranging in size from newborn to six months, and spent a whopping $63.87. Everything was name brand or designer label. WHATTTTTTTTT!!!! I highly suggest for all my mama, daddy, soon-to-be mama and soon-to-be daddy readers to look into this idea in your area. Target church sales that are in the most affluent parts of town, as they'll be likely to have some of the best name brands donated from wealthy residents, if that's what you're after. If you're not a quality snob like myself, just look for sales around town to save serious money on new or gently used baby items. These sales are an excellent way to save serious money on baby gear while maintaining a "quality snob" status. I can't wait to go to my next sale! I waited all weekend long for a day of sunshine to snap a good pic of our master bedroom. Friday. Saturday. Sunday. Monday. It would not stop raining in Dallas, y'all! The lighting is tricky because our master bedroom is an addition to the house, and the only natural light is from the French doors that lead out to our patio in the backyard. Adding to the challenge is the fact that the room is an L shape, with the bed having an alcove - an alcove away from the French doors and away from all natural light at that! (Which makes for an excellent sleeping situation, BTW). Anyway, enough with the photo excuses, lets talk design elements. First, the walls are a light grey and the floors have a cherry wood stain. Neutrals, whites and greys seem to be incredibly popular color schemes for bedrooms lately. In fact, our former duvet cover was a deep grey color from West Elm. But in a grey room that has minimal lighting, it just seemed so... I don't know, grey. So we decided to spruce up the room with some new details. We went with a duvet cover and shams from The Hotel Collection at Macy's. It's a silvery-blue-purple-grey and the pattern running through it is a metallic silver. I liked how the color complimented the walls without blending into them and popped against the floors. The metallic pattern brought out the silver lamps we already had (one from West Elm, the other from Pier One). I love how the lamps are similar in size and the same color, but the shapes are different to provide an interesting focal point in the room. 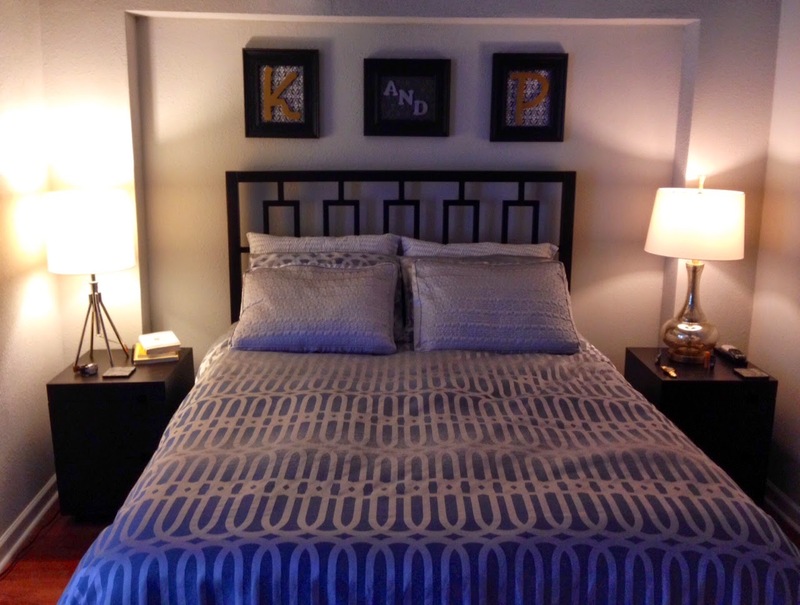 I mentioned in this post that I enjoy doing some crafty things, and the K and P you see above the bed was made by me. I picked up all the supplies at Michael's Craft Store. 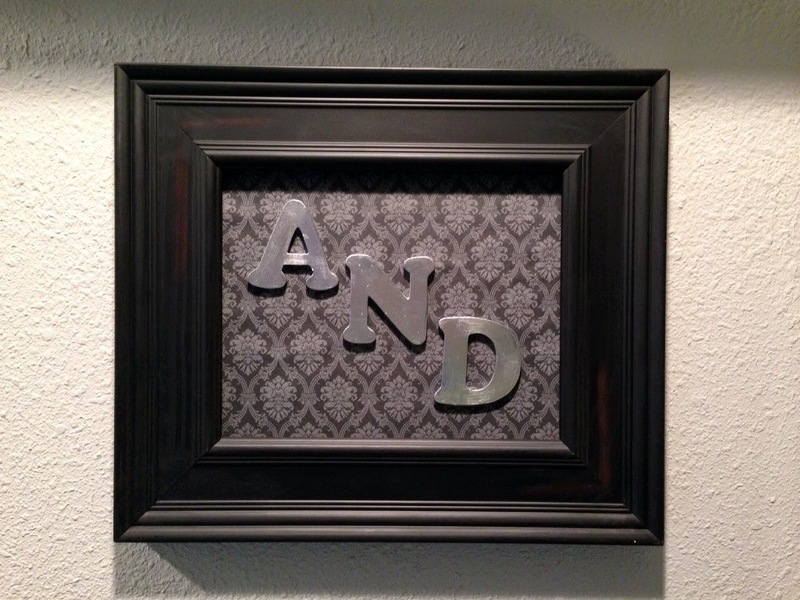 To DIY, you'll need to pick out your letters, the paint colors you wish to paint them, foam board, frames (glassless, backless, "in-the-raw" frames will allow you to construct this project freely), and then the paper you want as the background for the letter. Paint several coats of your desired color over the letter (I used acrylic paint), letting each coat dry fully before the next one. Cut your foam board with a razor to fit your frame, then rubber cement your paper background to the foam board (make sure the paper you select will fit the size of the frame). Hot glue the frame to the pre-cut, paper covered background foam board. After that has dried and your letters are painted, dried and ready, hot glue them to the paper covered foam board. 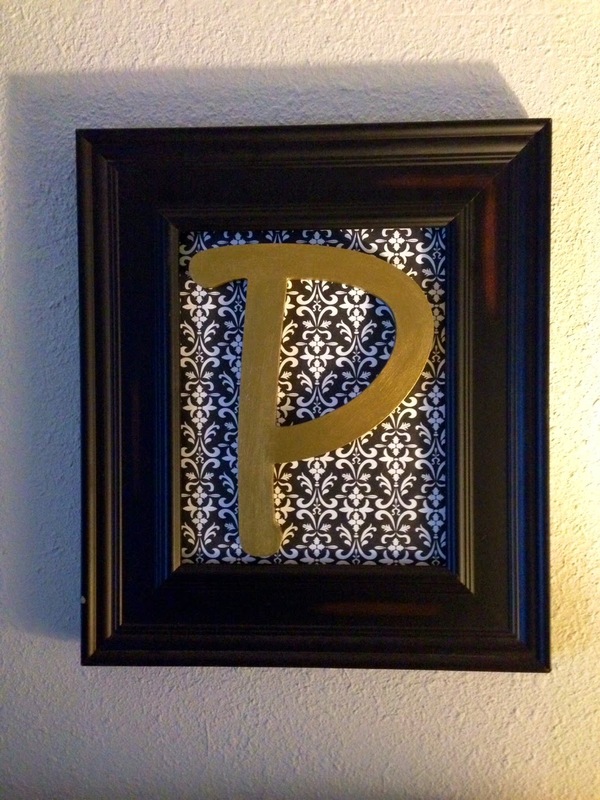 It's much easier to center the letter within the frame if your frame is glued down and ready to go first! TIP: I used a white foam board, but you can see the frames are dark. I used a Sharpee market to darken the quarter inch of foam board around the edges so that the white didn't stick out on the wall. Also, I used 3M wall adhesive (you know, the kind that come in strips and that you pull one side and it releases? Yeah, those) to get the finished frames on the wall. We love how the master bedroom is calming without being boring (you know, like shades of grey tend to be!) There's just enough purple and blue in the duvet cover for it to be interesting yet still "gender neutral" enough for both of us. 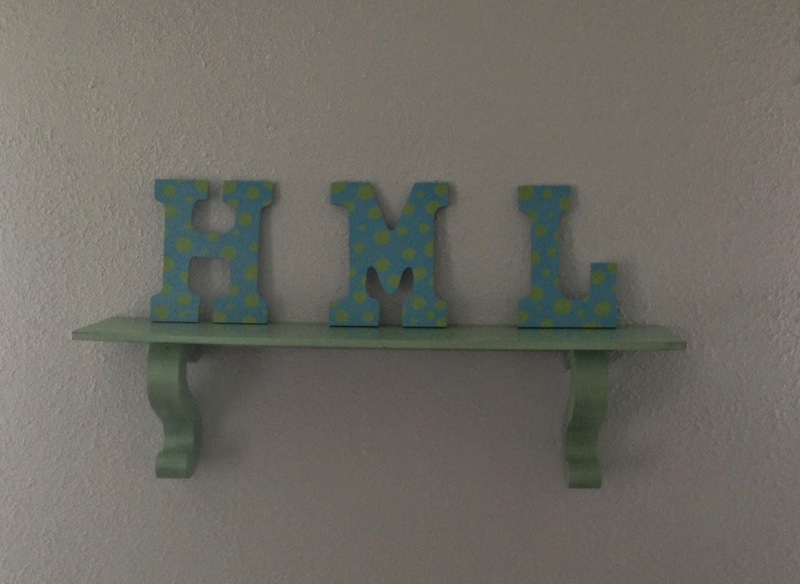 The personalized wall decor is perfect for such a personal space, and is pretty easy (and fun!) to make. The best part is that you can craft it to look good with any color scheme you have in your room. "That Guy" who is breathing so loud it's distracting? He's actually doing it right! It's called ujjayi breathing, or "the ocean breath." One performs this by constricting the back of the throat so that you control (basically, slow down and deepen) how much oxygen you take in and release in each breath. Coincidentally, this makes a sound. Ujjayi breathing helps you move from pose to pose while focusing more on your breath, and less on if your Warrior 2 is perfect. It also helps you to breathe entirely through your nose, regardless of how fast your flow is moving (the goal in yoga is to "train" yourself/your lungs to function via the nose so that you're more mindful about your breath). Yes, not only did I just give you permission to make strange sounds in your next yoga class, I'm encouraging you! It's a bit strange at first, but I now LOVE being next to loud people as it reminds me to do the same, and almost "gives me permission" to be louder in class. "Inhale joy into your lower spine; exhale out negativity." In teacher training to become a yoga instructor, we actually get tested on our verbal cues on breath and body placement. Some poses work better on an inhale, others are best for an exhale. That's why the instructor is telling you when to breathe. For example, you wouldn't want to take a big breath in for a forward fold - by nature of anatomy, your inflated lungs would inhibit your ability to fully bend over, limiting the stretch you would/should get. Crazy-smiling-mala-bead-wearing-hippie. The mala beads have 108 beads on them, which is a sacred number in traditional yogic practices. The beads are used as a "counter" of sorts, so that s/he can repeat their own personal mantra in their head that very specific number of times. I can't personally multitask to the level of listening and practicing a flow AND repeating my own mantra 108 times in a class. The five or so minutes you get in savasana at the end isn't remotely enough time to make it through 108 repetitions, so I don't personally wear them in a class. But I certainly don't judge those who do! They have more yogi skills than I do, that's for sure. Why are they so dang happy looking and smiling?! Remember that personal mantra I was talking about? I can PROMISE you it's something positive, whether it's reflecting internally (about themselves - "I am loved. I love") or it's external ("The world is good. The world is beautiful.") When you start to repeat positive messages over and over again, and you focus on your breath in a class and release tension and stress, there simply is no way that you wouldn't smile. That crazy hippie in the back practices this everyday. Frankly, they've got it figured out, readers! I used to think, "Damn she looks insane!" and now I think, "Man, she's got it together! I'm going to work to be more like her. She looks 15 years younger than she really is and is clearly happy... Wait, where are my mala beads?!" The thing that's so great about yoga is that you can take the parts that work for you, and leave the parts that don't. However, I'd encourage you to look into and experiment with the part of yoga that you judge or make you uncomfortable. You never know what you could be missing! At worst, you conclude that it's indeed not for you; at best, your whole life is changed for the better. *You'll notice in the photos that my hands aren't flat on the mat - they appear as though they're cupping something. That's intentional! Your wrists host TONS of nerves that go to your hands and fingers. Cupping your hands like I do in these photos is a way to take the weight off the center part of your wrist where those nerves travel, and prevent pain that can come with long-term yoga practices/poses that carry a lot of weight in your upper body (such as arm balances and inversions). This effect is magnified in pregnant women. I was about 28-29 weeks in this shoot, so my hands are "extra cuppy" to protect my wrists. Hey, the more you know, right?! Most of you know by now that I was put on bed rest last week in attempts to curb my preterm labor. Going from someone who didn't sit down for longer than 30 minutes at a time to being confined to the house and laying around for most of the day has been, ummmm... Interesting. And by interesting, I really mean the opposite of interesting because actually it's quite dull compared to my former life. Since I am fortunate enough to get some move about time to shower and such, I immediately realized creating a daily schedule (like I did when I started working from home) would be KEY in still feeling like a normal, productive human. Showering, putting on some makeup and doing my hair is crucial to not feeling like a hermit-slob-preggo! I think my husband appreciates it, too. However, since so much of my time is confined to a horizontal position, it really doesn't make too much sense for me to get FULLY dressed (you know, jeans would dig into my hips as I lay on my side; a "real" bra would do the same and the wires would shift about, etc). So upon the second day of my "bed rest sentence" I realized I'd have to utilize some of my yogi style skills so that I felt normal, but could still stay comfortable. Essentially, I determined that I needed to get "ready" enough so that I felt pretty and normal, but not enough to be uncomfortable all day long. Normal for me happens to be yoga clothes, which just so happen to ALSO be comfortable! WIN! So, my yogi wardrobe will remain in high rotation despite the fact that I'm banned from my mat for the next six weeks. I don't normally wear any jewelry to the yoga studio, so I decided to include a necklace/earrings/watch/etc with my daily look to be a little more "fancy." As you can see, this "look" is completely appropriate for those of you lovelies who are not on bed rest but want something comfortable yet functional on the weekends. 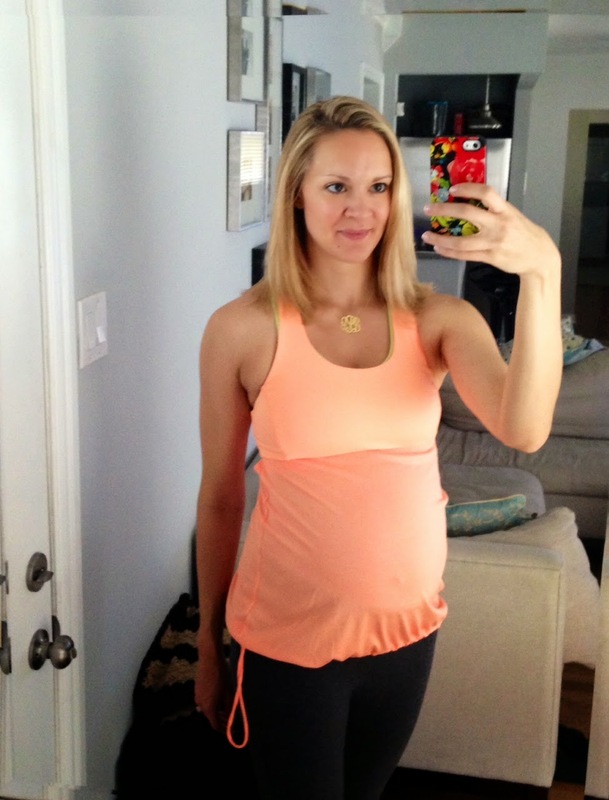 Maybe you're not pregnant but want some new ideas to wear on your yoga mat, or just out running errands. Any way you slice it, I'm a huge fan of dressing up my yoga clothes to become an actual outfit! Beyond the "what to wear" question, it also struck me as ridic to put a full face of makeup on when not only am I not leaving the house, but I'm lying down (hello bronzer stains on throw pillows!) 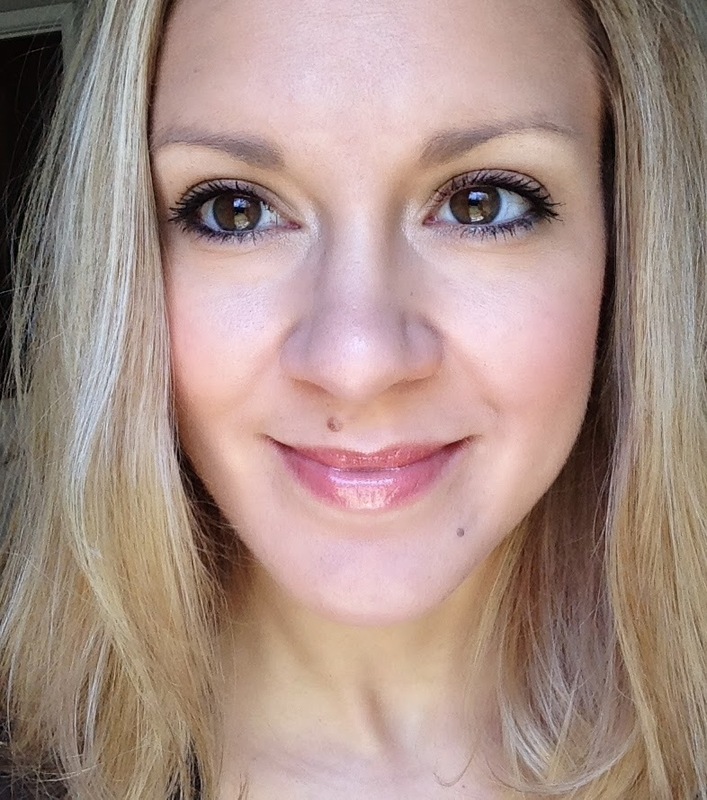 So, I decided to do a super-toned-down makeup routine. It consists of under eye concealer, blush, brow highlighter and mascara. Juuuust enough to make me look good and alive! Not enough to waste too much of my treasured "up" time by doing extensive makeup that nobody besides my husband and doggies will see. Bueno! My hair has become INSANELY STRAIGHT during pregnancy. So the hair you see pictured above has zero product in it, and is a byproduct of simply blow drying it. No round brush, no hairspray. This is just how my hair rolls. Loooooooooove my low-maintenance hair! I've mentioned on social media before about how disappointed I am in Target Maternity, and was NEVER a Target clothes shopper prior to pregnancy. There always seems to be threads hanging from every seam and the sizing doesn't work for tall, lanky people such as myself. That's my disclaimer for this review! Now. I'm 31 weeks preggers. I'm huge. I have an extensive collection of expensive yoga wear from high-end brands that I abso-freakin-lutely ADORE. Which is why I went and attempted to get some "cheap stuff" - I don't want to stretch out my pre-pregnancy yoga clothes so that I can't wear them post baby. But since I only have a few weeks left, I didn't want to go and spend my husband's entire paycheck (you're welcome, babe) on some new outfits. So I gave Tar-get one more go. I managed to find this top, AND it was 50% off. If you read this post, then you know this week was on a whole different level. Which means, a whole different level of High Five for Friday. Not that I'm not thankful for "little things" this week, but preeeeeeety much all of my thankfulness surrounds the fact that I did NOT give birth this week to a 3lb baby! 2) My bed rest is a two hours on, two hours up situation. I don't HAVE to be horizontal All. Day. Every. Day. I can still shower and do some normal-people activities! 3) In fact, I used one of my "two hour breaks" to run to Micheal's Craft Store and get some crafting materials for the nursery. 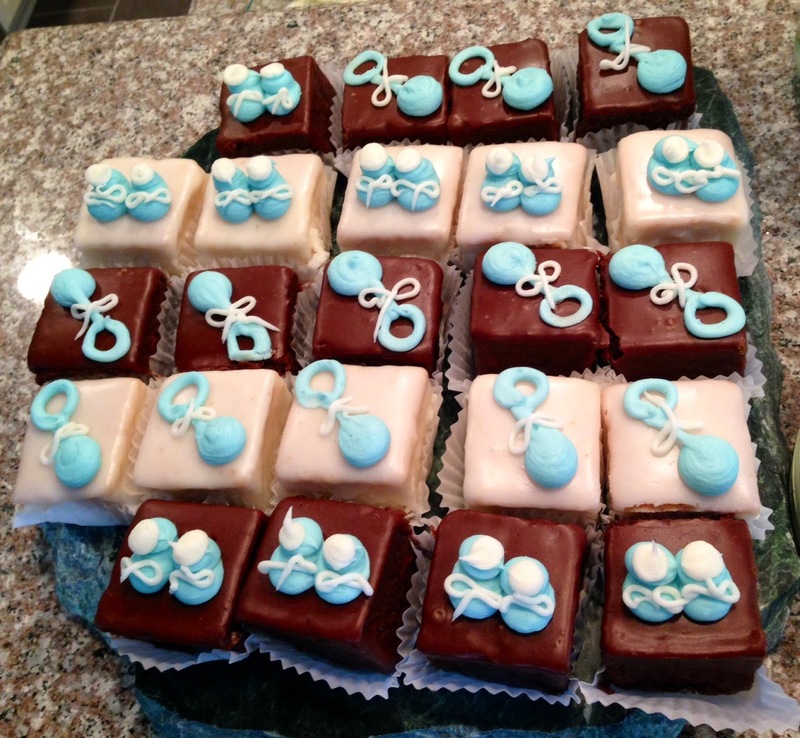 HINT: These are indeed baby boy's initials/monogram. We've have his name picked out since the beginning, which was good because we only had a boy name picked out. The story goes like this: Me: "Babe, I want to name our baby _________ if it's a boy; I've loved that name for YEARS." Hubby: "I like it! Done." Which, frankly, is how most decisions are made in our household; me asking for what I want/what my husband thinks, and him (very wisely!) giving the go-ahead. What can I say, I know what I want. 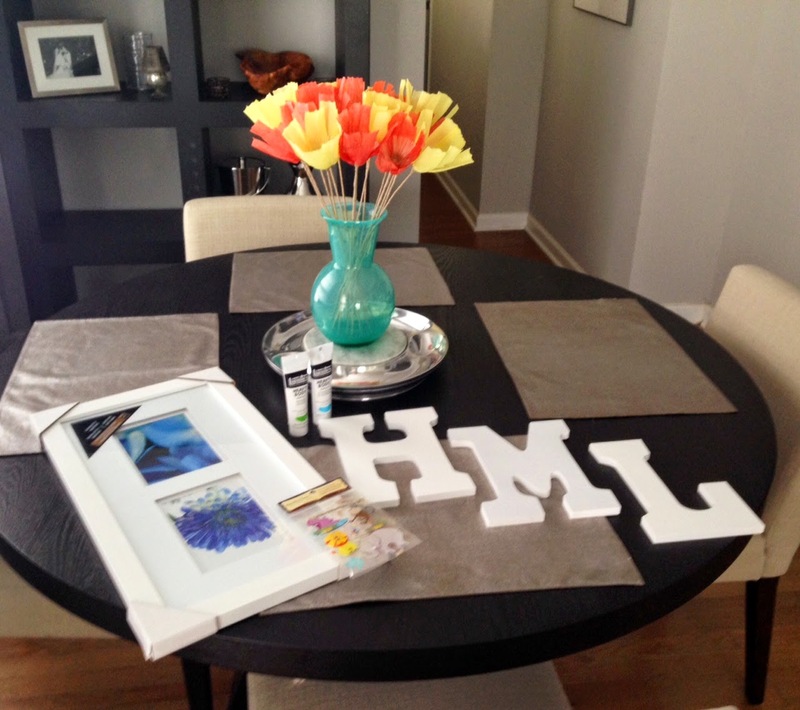 Monogram painting and picture frame crafts are underway! 5) If you follow me on Instagram then you likely know about this pic. I've gotten TONS of dog snuggles since being laid up on the couch! My little man Otis Beaufort is the BEST at dog snuggles. Two words that literally encapsulate my own personal definition of hell. Bed bound. Couch bound. No exercise. No activities. No outings. No life. I have been put on bed rest for essentially the remainder of my pregnancy: for the next six weeks or until my condition stabilizes and improves. I had initially typed up a whole novel, describing what happened - not in extensive detail, but the post got lengthy anyway. To spare you the boring, medical heavy read, I started to go into preterm labor. My contractions were painless, but I did have "back labor" that was INDEED painful. These painless contractions (called Braxton Hicks... Until you start to have them ten minutes apart) even started to dilate me so that this little 30 week gestation babe would come out. No no no! Thankfully, my midwives were able to assess my situation and give me some tools to stay out of a hospital and keep this baby in and cookin' for a while longer. Best rest is a surprisingly controversial topic and medical practice. It's not my or my midwives goal to keep me on this obnoxious path; but drastic measures had to be taken to stop my body from going into labor, relax my muscles (including that big bully of a muscle, the uterus! ), and get things back on track to having a full-term baby. I have another appointment in two weeks to reevaluate how things are going, and there is a chance I could have some of my restrictions lifted. Then again, I potentially could stay on this path for a full six weeks. Exercise (at least, in the forms that I'm used to) are O-U-T until 37 weeks when I'm full term and baby boy can safely enter the world, but that's ok with me. I'd be happy with the ability to leave the house at this point! I'm writing this from my bed, not from a NICU. I'm feeling my 30 week old son move inside me, not staring at him wiggle and struggle to breathe in an incubator. He's still exactly where he should be and still getting exactly what he needs to make a successful entrance into the world. There's a chance I won't have to spend the remainder of my pregnancy on bed rest! If things have improved at my next appointment, I'll likely be able to incorporate light daily activities back into my day with scheduled rest time. I'm very encouraged that even in the short time I've been on bed rest, my contractions have DRAMATICALLY decreased - what I used to experience in an hour, I'm not even having in a 24hr full day. This is promising! At my next apt, I'll be 32 weeks and having multiple, painless contractions a day will officially be in the "normal zone." Yay! I have some amazing friends and family. Friends who have gone "on call" in case I need anything, and family who volunteered to fly to Dallas immediately or upon me/my husband's request to help out. Seriously, we lucked out with some great people in our lives. All MAJOR baby preparations are done. He has all his furniture ordered and it will start to trickle in over the coming weeks; all important gear (i.e. car seat) is already in our home; registries are created; most new born necessities bought, etc. Any remaining things I need can be bought online and shipped to my front door, and I can use my two hours of "up time" to organize the nursery. THANK GOODNESS. And since sharing a pic of me on bed rest wouldn't be very interesting, nor is my view from said bed/couch, nor are my activities, here is a preview shot I received yesterday of our maternity shoot I referenced above! We lucked out with a beautiful, sun shine filled day to spend at White Rock Lake and the Dallas Arboretum. I love that we can have a March outdoor shoot in tank tops and blooming flowers in Texas! I mentioned in this post that I was working on a project for the living room. 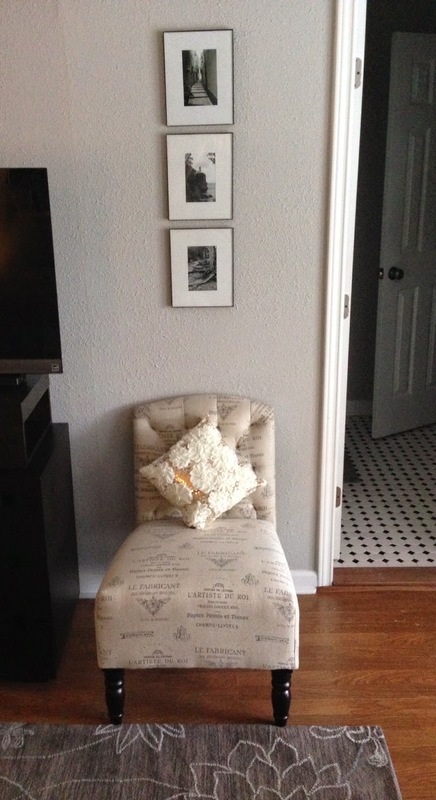 Last week, I posted this post about blending styles to create a comfortable living space when you and your spouse have, uhhh... errrrrr... Different styles. I'm happy to report that I was finally able to complete our living room decor this past weekend! This project has been on my brain for well over a year. I had every intention of doing this in the townhome that we used to live in... But never quite found the time to select what prints with what frames to create a cohesive theme. Yadayadayada. I just never did it, end of story. The silver frames are from Crate & Barrel; the black frames are unknown! 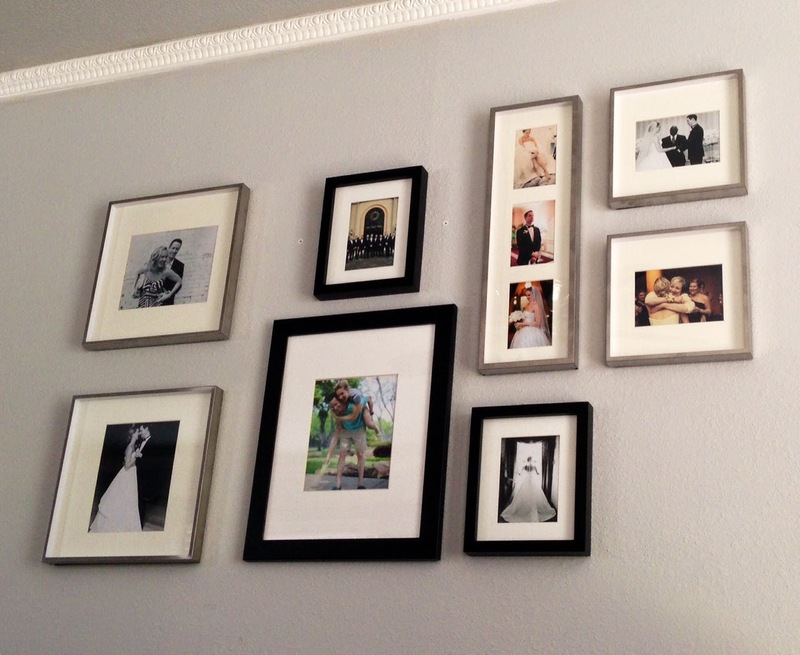 You'll see there's room to add more frames as we expand our family and we also have the option to rotate out the pictures within the frames to keep our wall "current." We have a "great room" type of setup in our home, so that the living room, dining room and kitchen are all open to each other. While this is a large space, we also have four massive, floor-to-ceiling windows. These windows let in a wonderful amount of light into the room, but REALLY limit the wall space for any sort of artwork/decor. So while we have this big space, it's broken up quite nicely with the windows so that we don't have one (or more!) massive, blank wall to attempt to cover up. 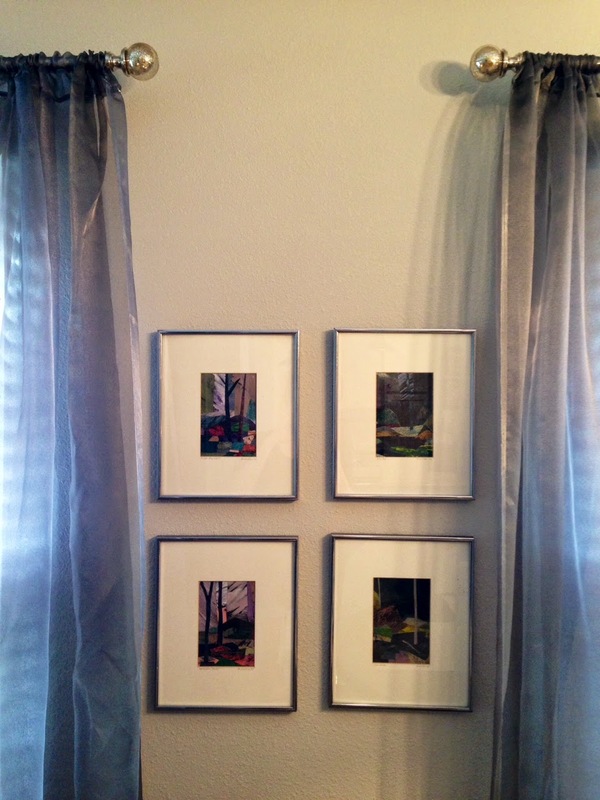 The same concept applied with four pieces of art, all the same size in the same mat and frame. This is the only wall space left with all the large windows in our Great Room! The curtains also work to add some texture to the room. Having smaller pieces on the wall provides some balance to the room, so that it's not dwarfed by all the "big" things in it. Creating a wall decor look sufficient for the space out of smaller items helps provide balance when dealing with a large space full of large furniture. It can also break up consistent shapes in the room. For example, if you have a rectangle couch, with a rectangle coffee table, with the rectangle of your TV all in the same room, you can "break up" that shape by creating an array of frames creatively on your wall. In the picture above, I used a square to break up the long rectangles of the windows.